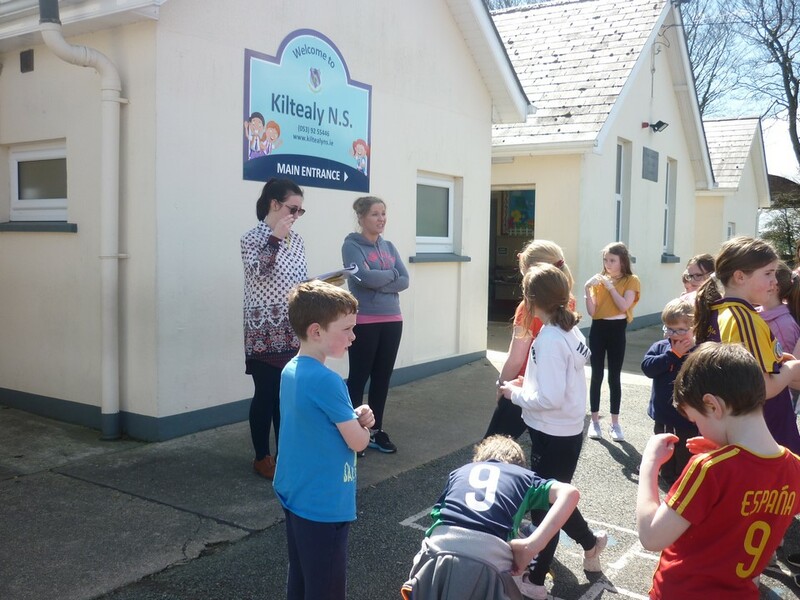 Two staff members from Kiltealy have trained in the INPP (Institute For Neuro-Physiological Psychology) programme for schools. 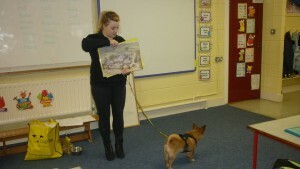 This programme has been designed to allow teachers to more effectively assess neuromotor readiness for learning. 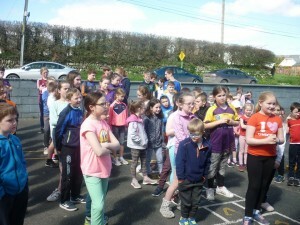 It requires teachers to facilitate a short exercise programme each day for certain classes. 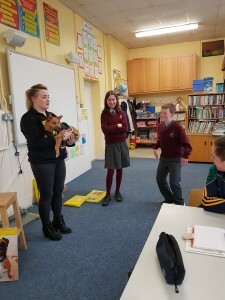 The programme was delivered by Aoife Caulfield and Judy Breen and is of particular benefit to students who exhibit neurodevelopmental delay (NDD). Nevertheless the exercises are beneficial for all. 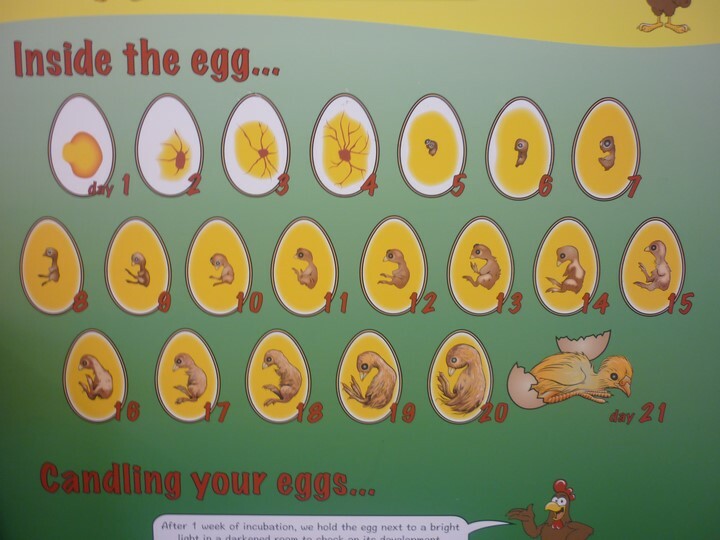 Listed below are some of the indicators that are commonly known to be indicative of NDD. 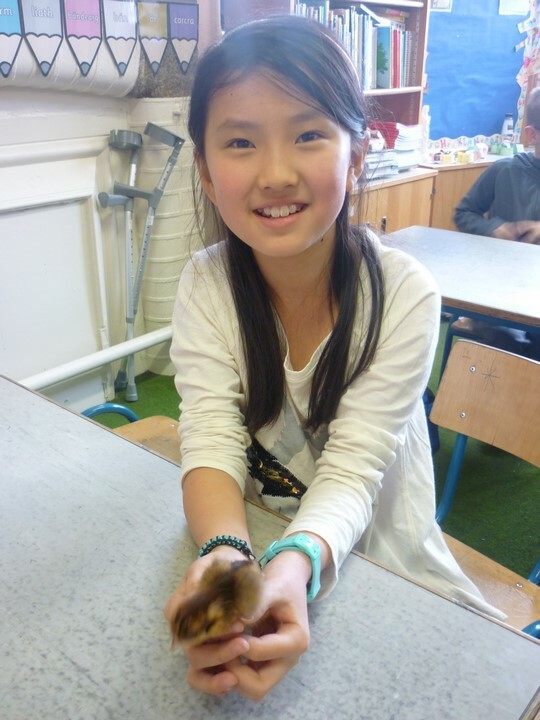 Visual and auditory processing difficulties. This programme will be rolled out in our school from September 2018. 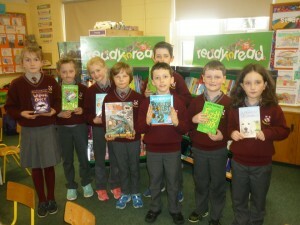 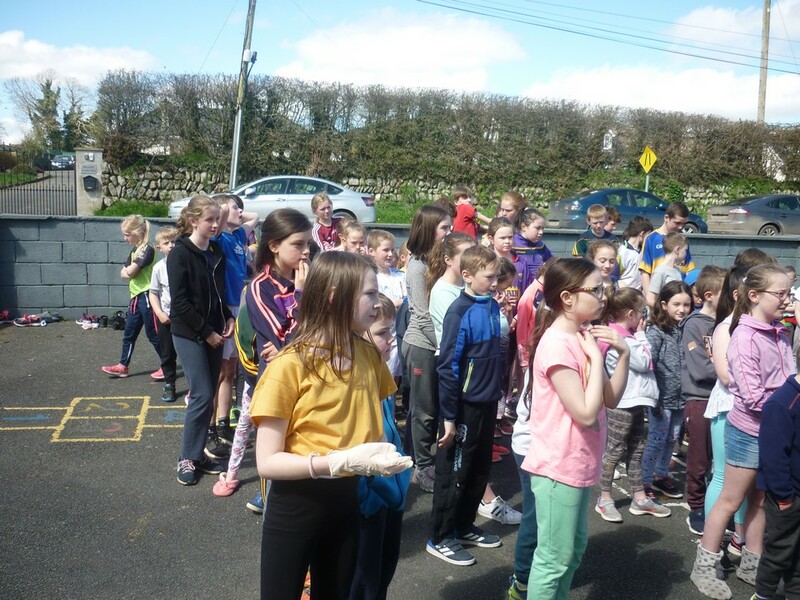 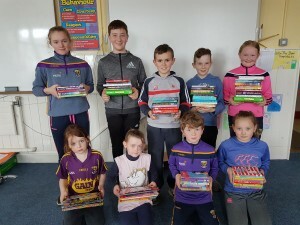 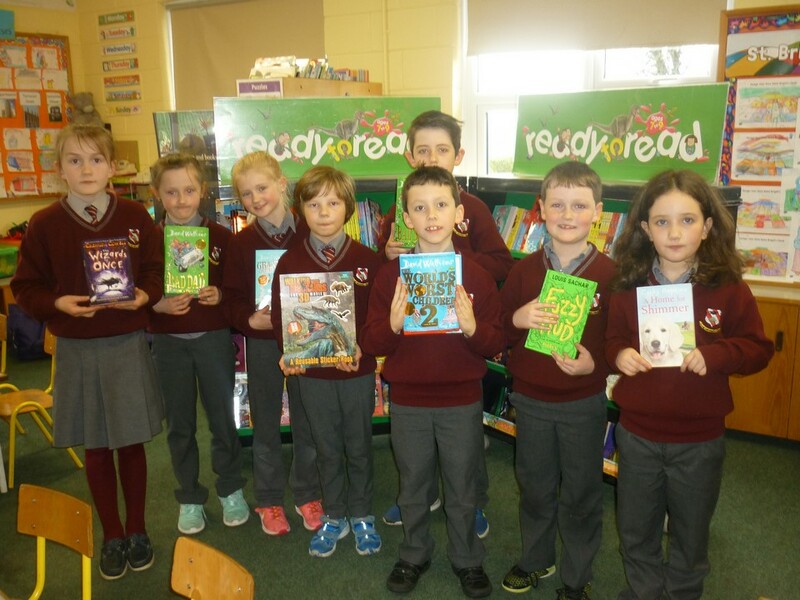 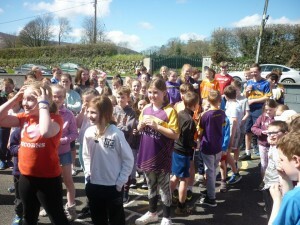 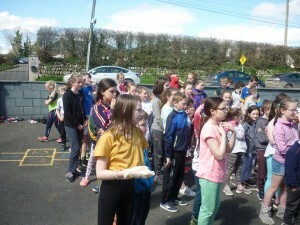 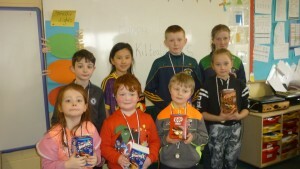 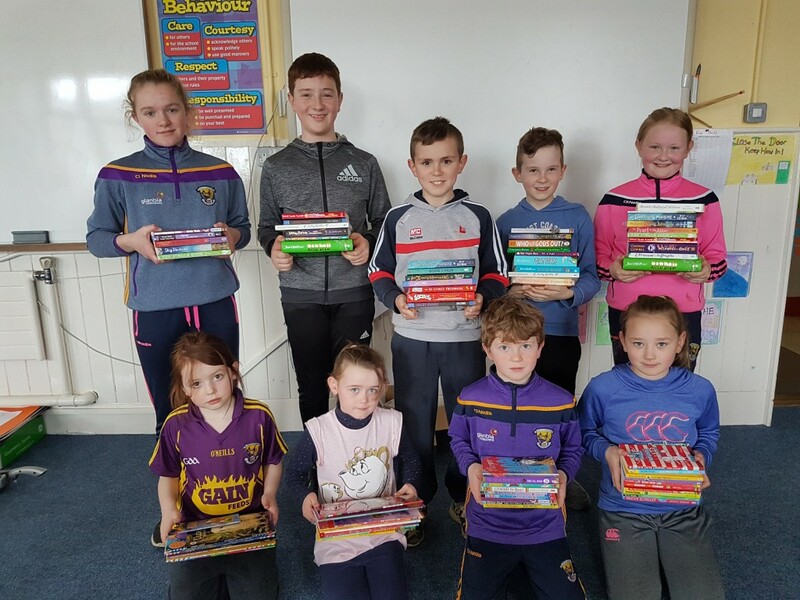 The Readathon in Kiltealy NS commenced prior to Easter. 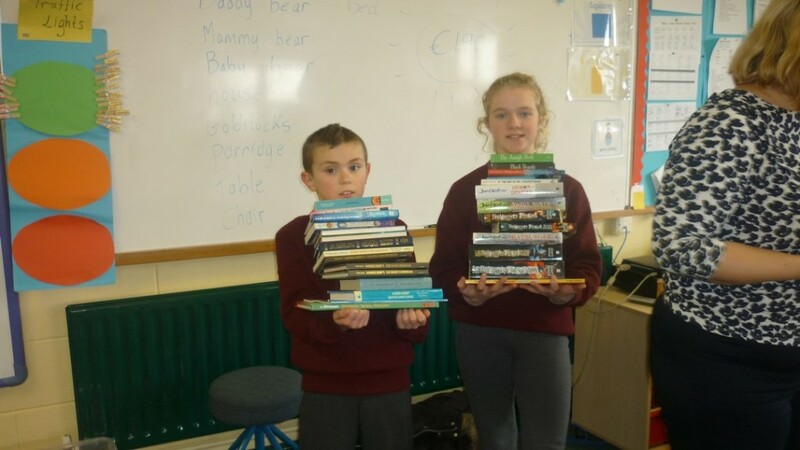 Ms. Kehoe was thrilled to announce that the number of books read exceeded last years total. 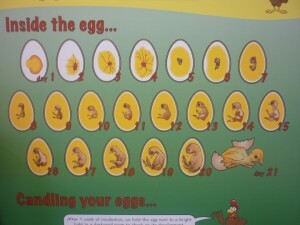 Final numbers will be added to this post shortly. The sunshine last Friday was an excellent opportunity to announce the winners of the competition outdoors. 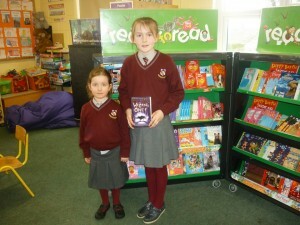 The pupils showed an amazing interest in this years reading initiative. 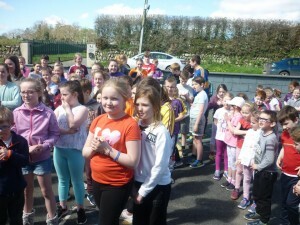 Congratulations to all who were involved. 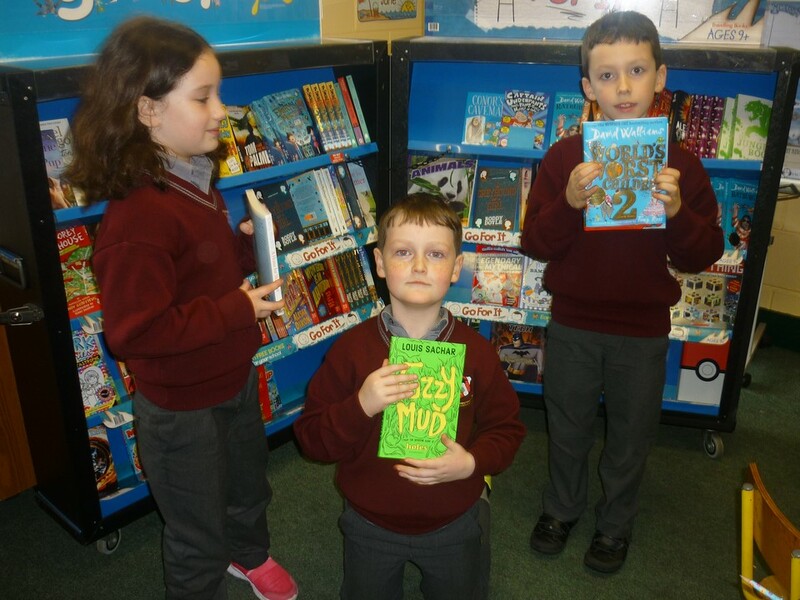 We teamed up with Celtic Travelling Books this week in hosting a fantastic Book Fair. 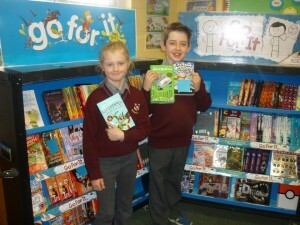 The book fair was really well supported by pupils and parents and earned us a huge amount of books for our classroom libraries. 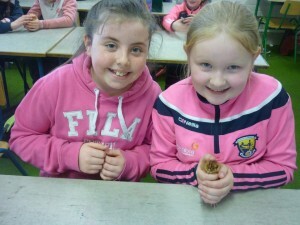 Thank you to all teachers and our students council who helped run the fair and make it the great success it was. Above are members of our student council with all the books earned in reward for books purchased in our book fair. 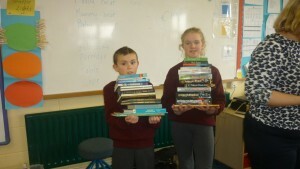 The pupils cant wait to get their hands on these for some great reads. 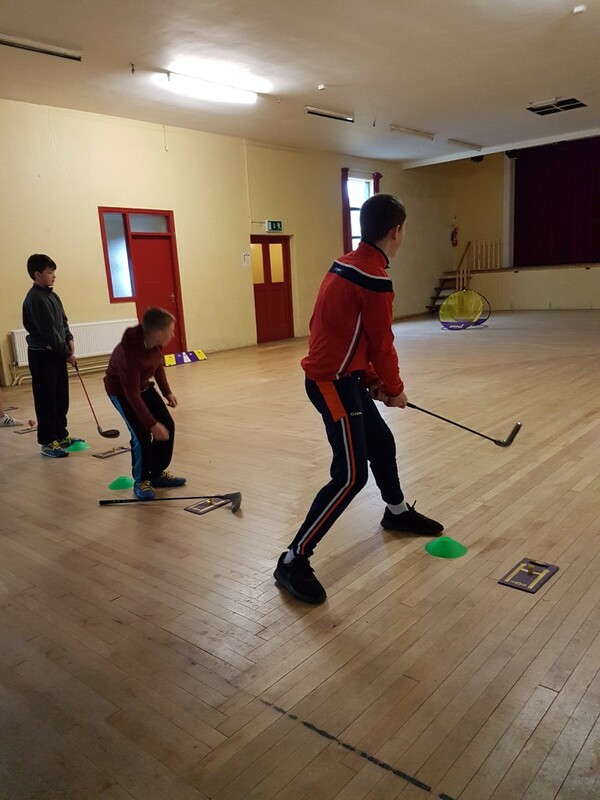 Hurling and Camogie season has commenced for 2018 and we are off to a flying start. Mini 7s round 1 took place just before Easter and despite our boys putting in two super performances against both Marshalstown and Rathnure, one win and one loss wasn’t enough to send them through to Round 2. 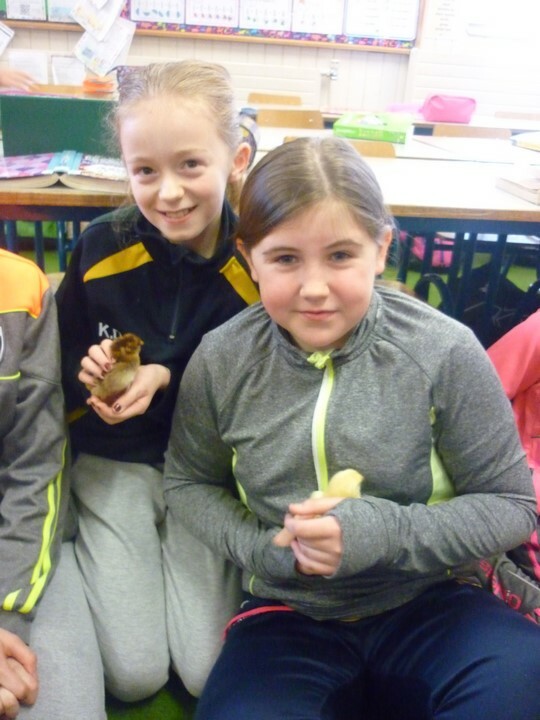 The girls did progress to Round 2 with convincing victories over Kilmyshall and Marshalstown. 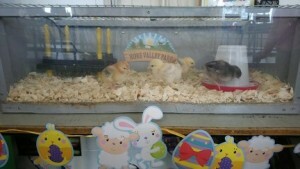 The girls will compete in Round 2 next week. 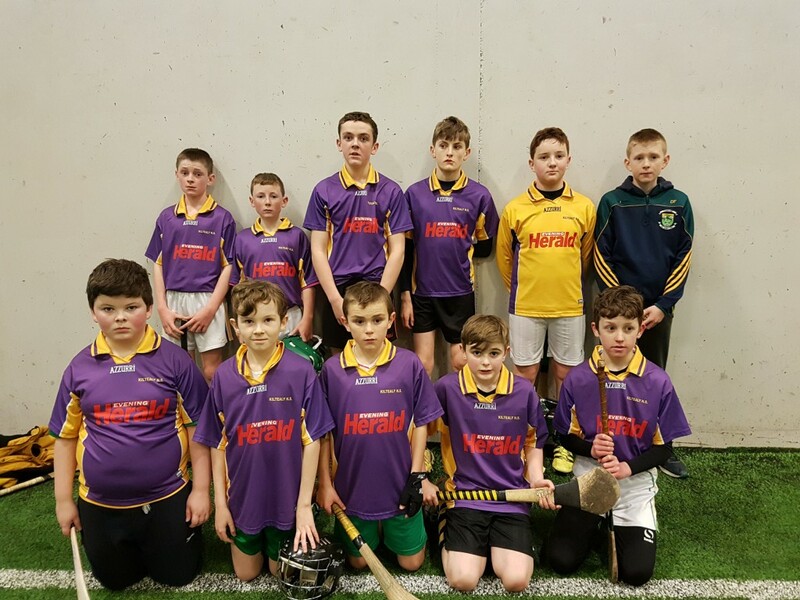 Rackard League has also begun on the back of a victorious season in 2017 with both teams bringing home the silverware in their divisions. Our boys had a great win over Rathnure on Monday in their first game and look forward with confidence to their next game. The girls Rackard League team gets their campaign under way this Thursday against reigning Roinn A champions Kilrush. 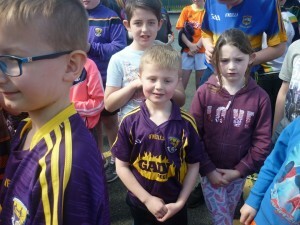 We wish both the boys and girls teams the best of luck throughout the League. 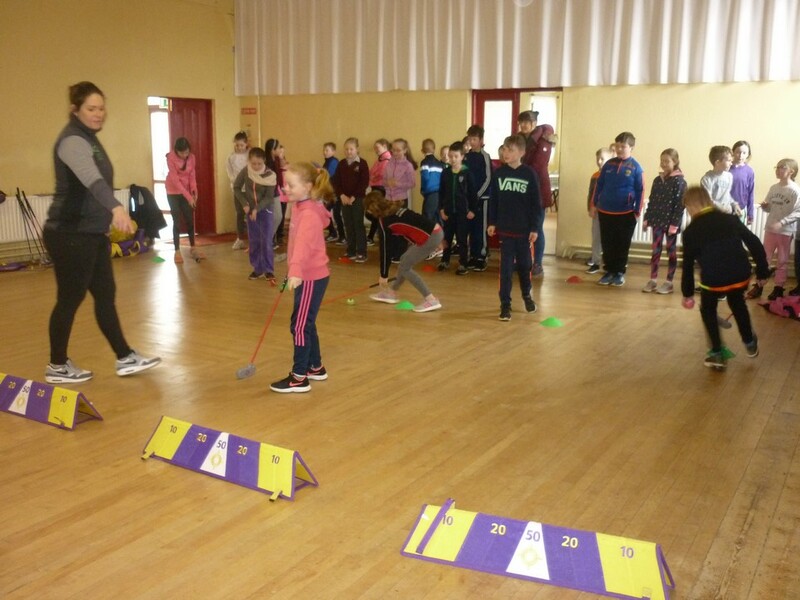 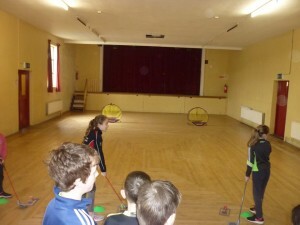 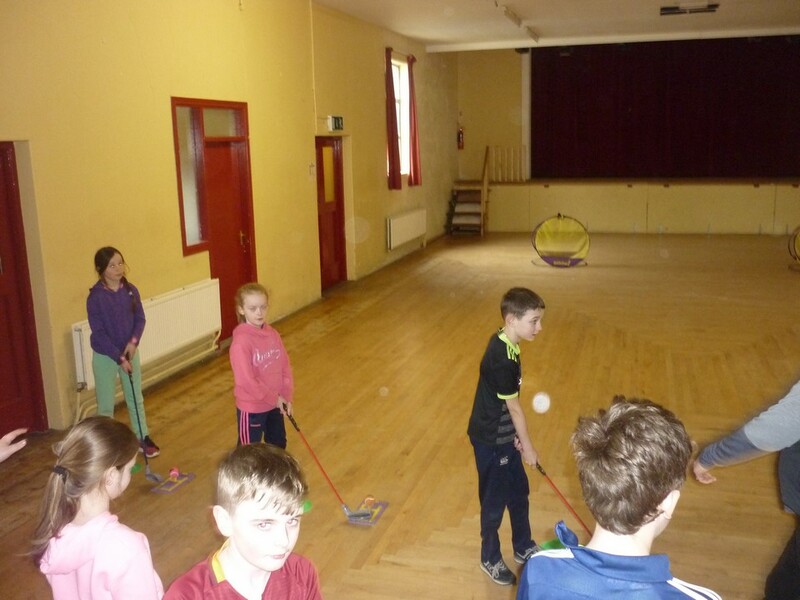 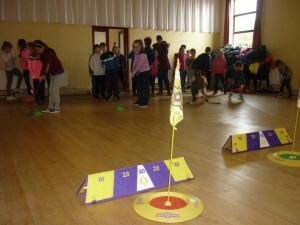 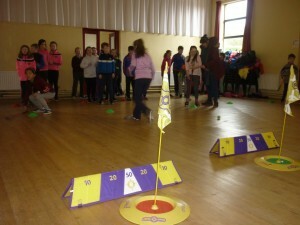 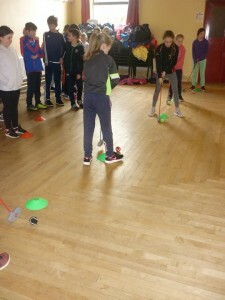 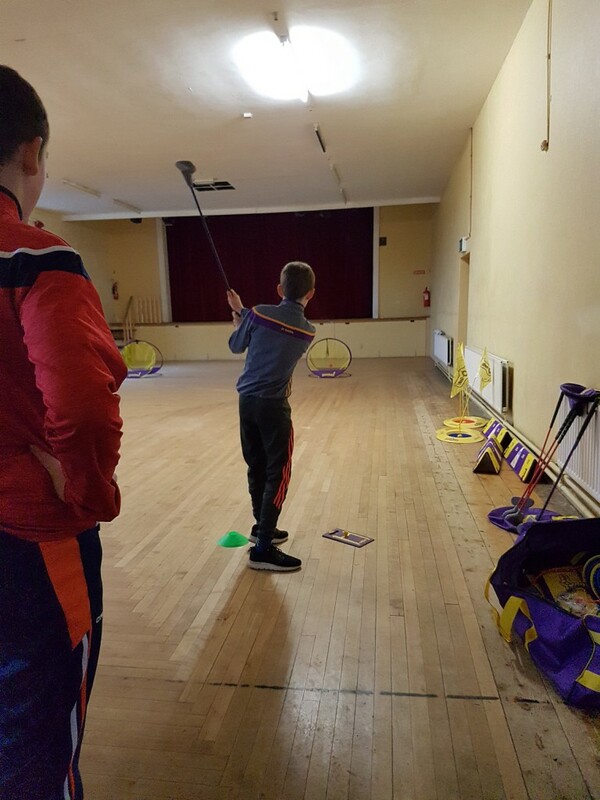 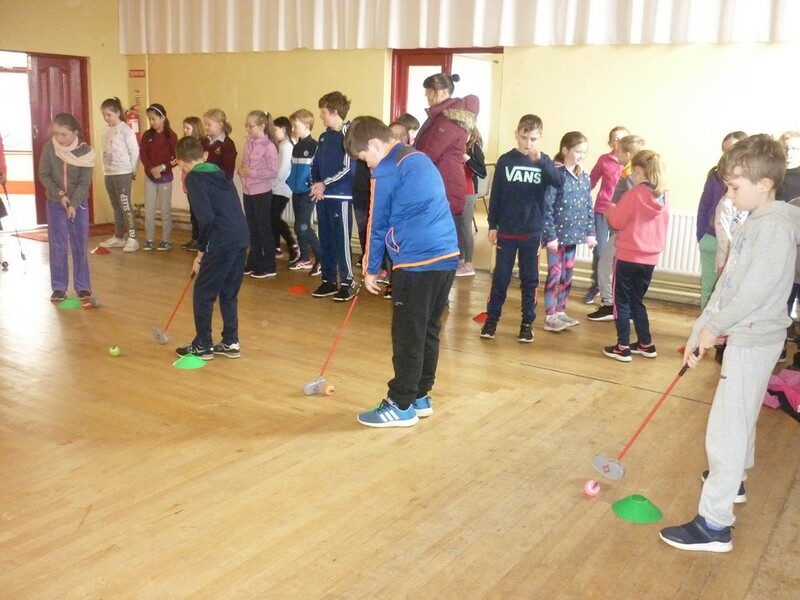 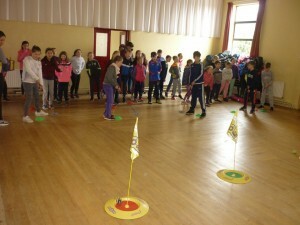 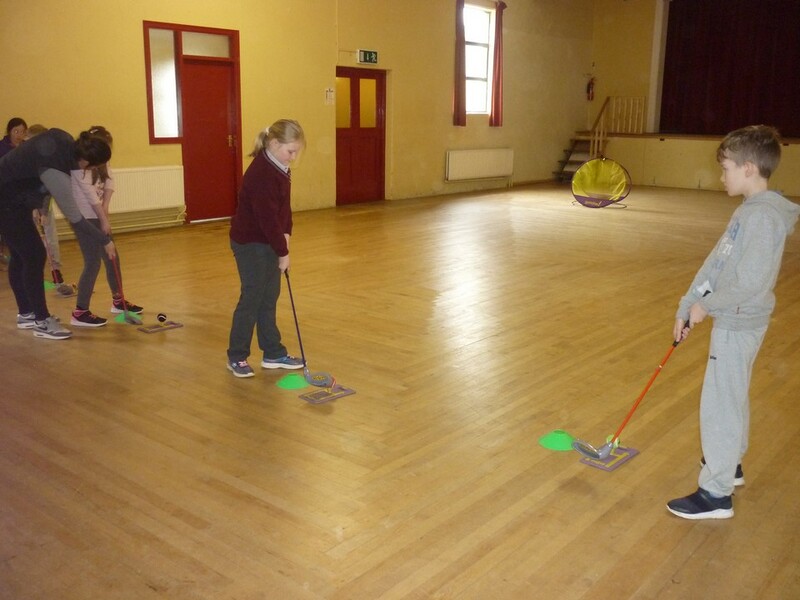 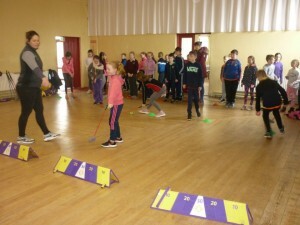 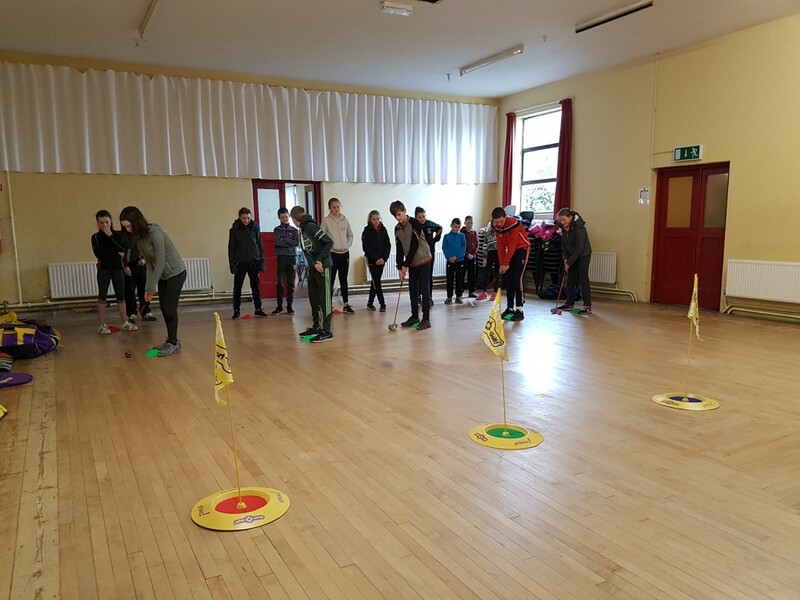 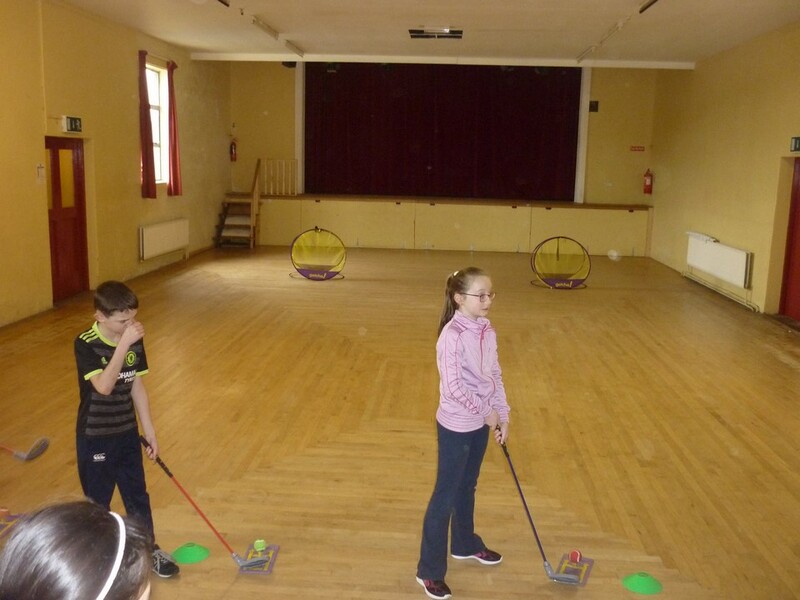 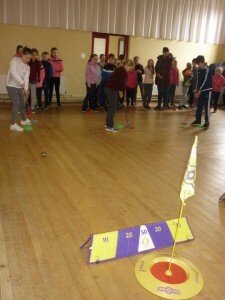 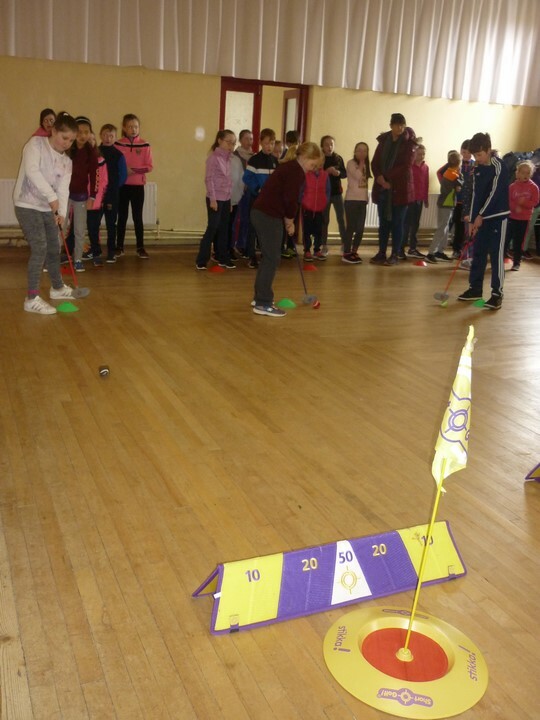 Pupils from 3rd to 6th class were treated to a beginner golf lesson today. 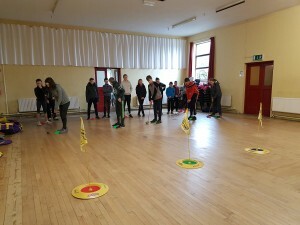 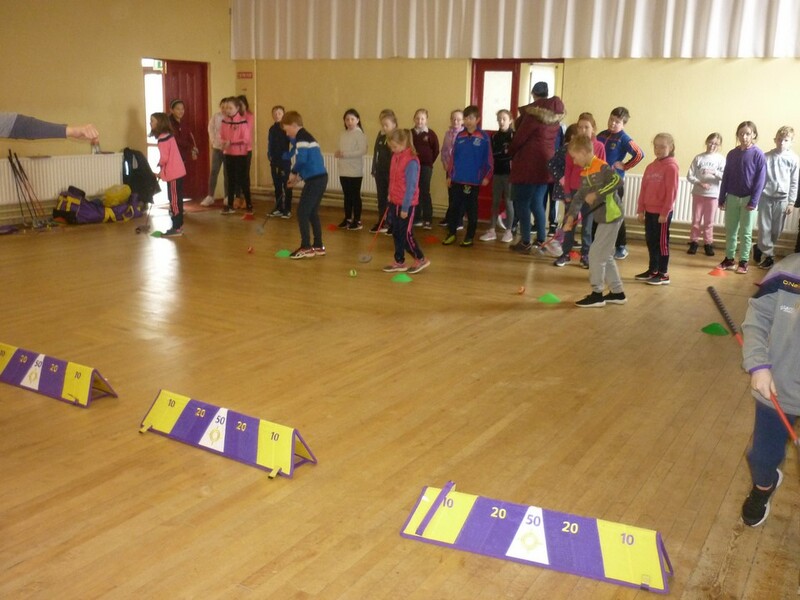 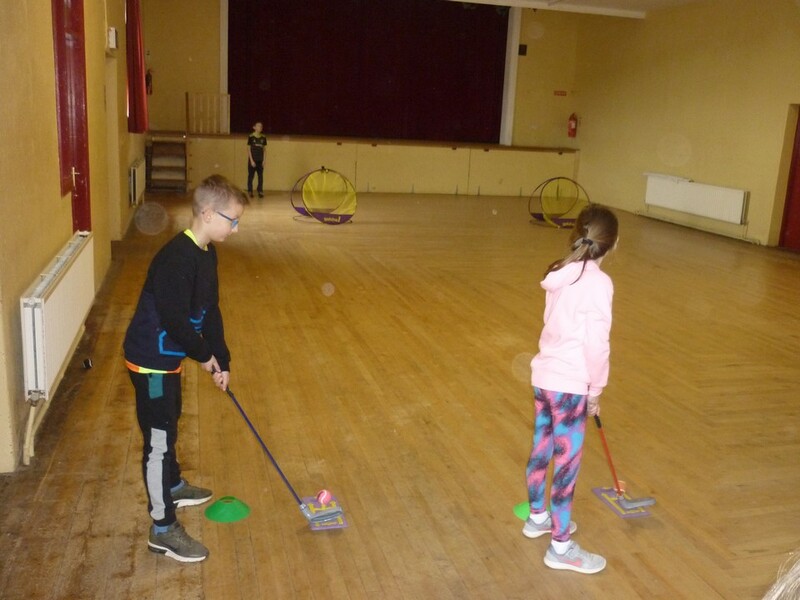 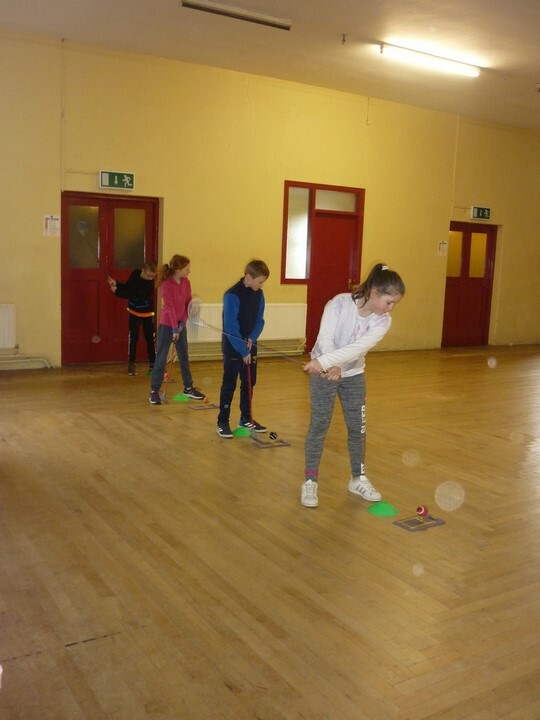 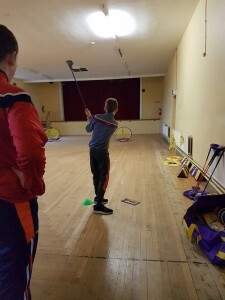 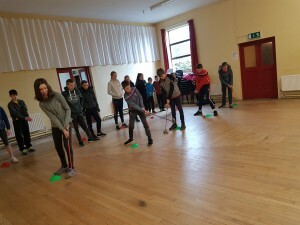 Weather forced us indoors but that didn’t stop the fun as the pupils perfected their technique in the various skills of golf. 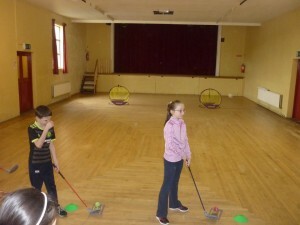 Rumour has it the teachers pitched their shot to the net too, bagging the kids a night off homework!!! 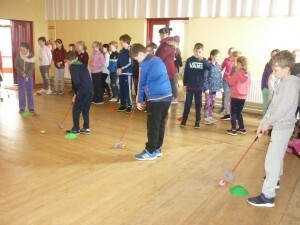 Great days fun all round! 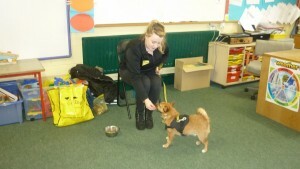 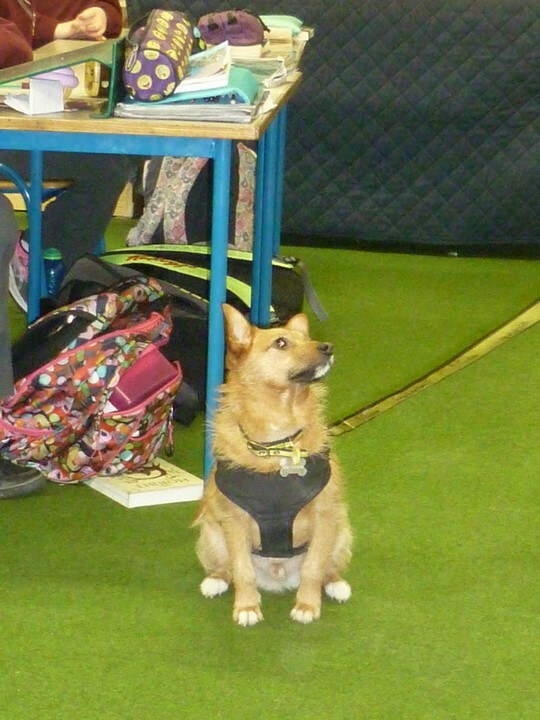 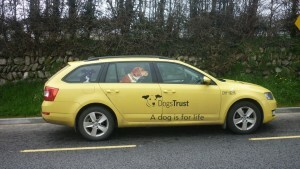 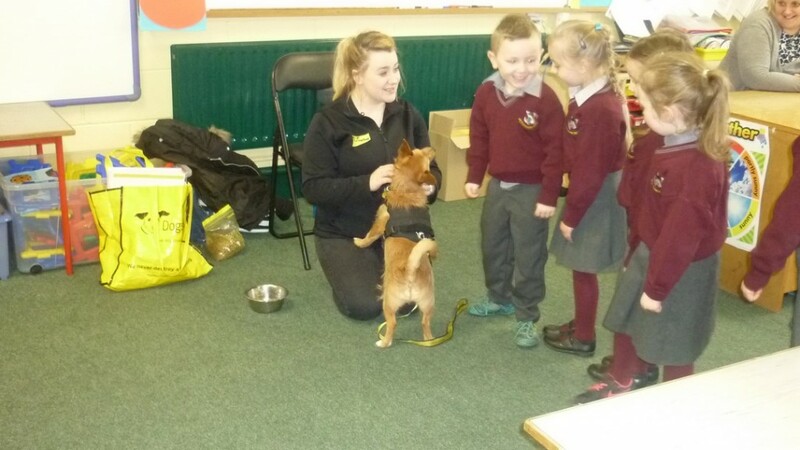 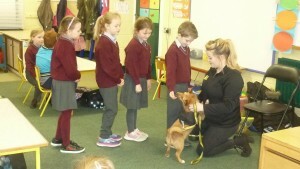 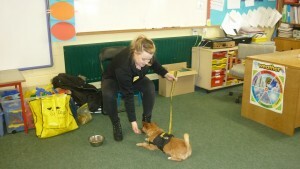 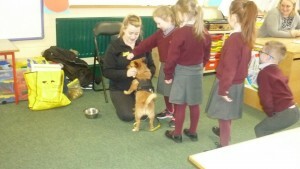 We recently welcomed Heather and her dog Ted from The Dogs Trust. 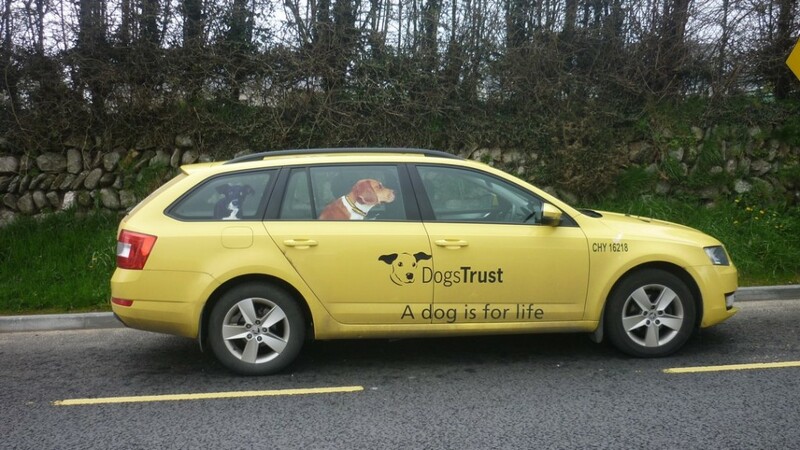 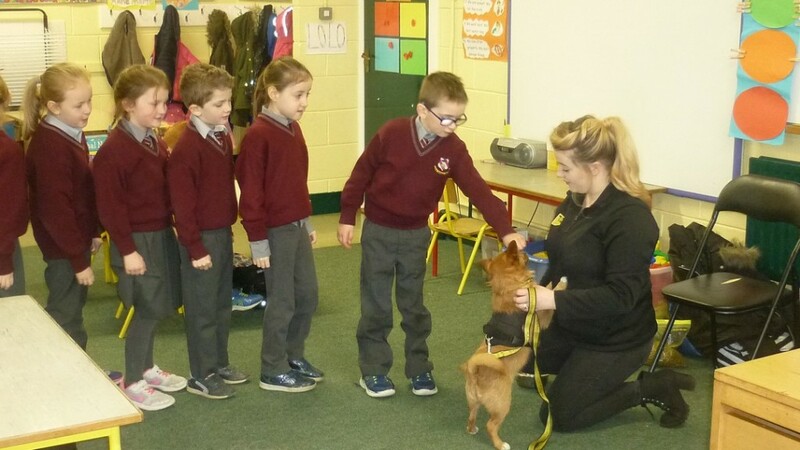 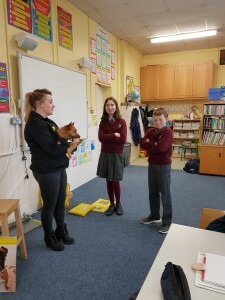 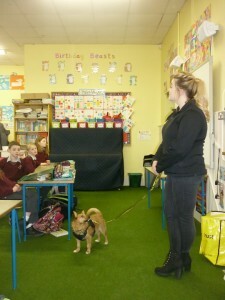 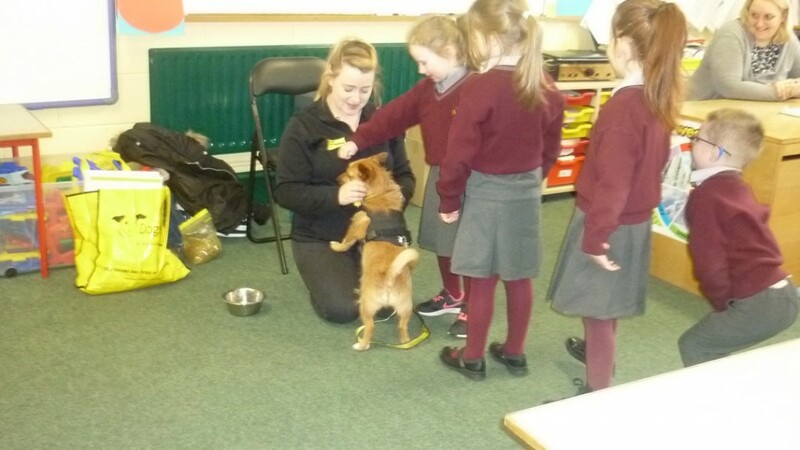 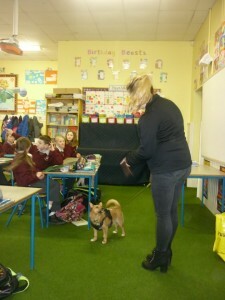 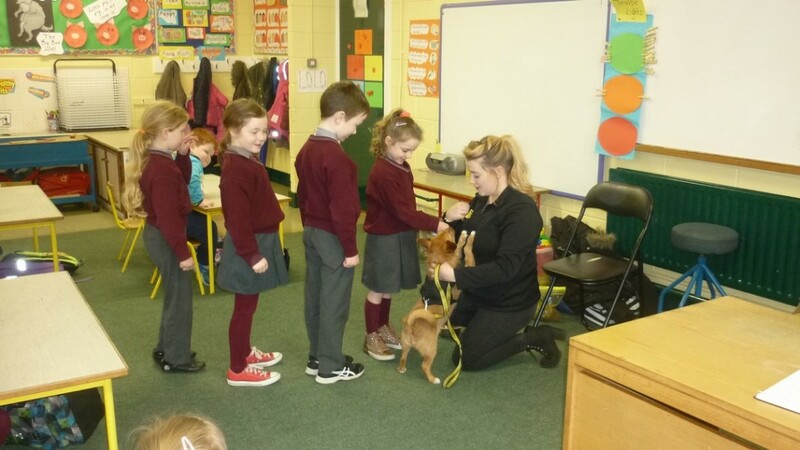 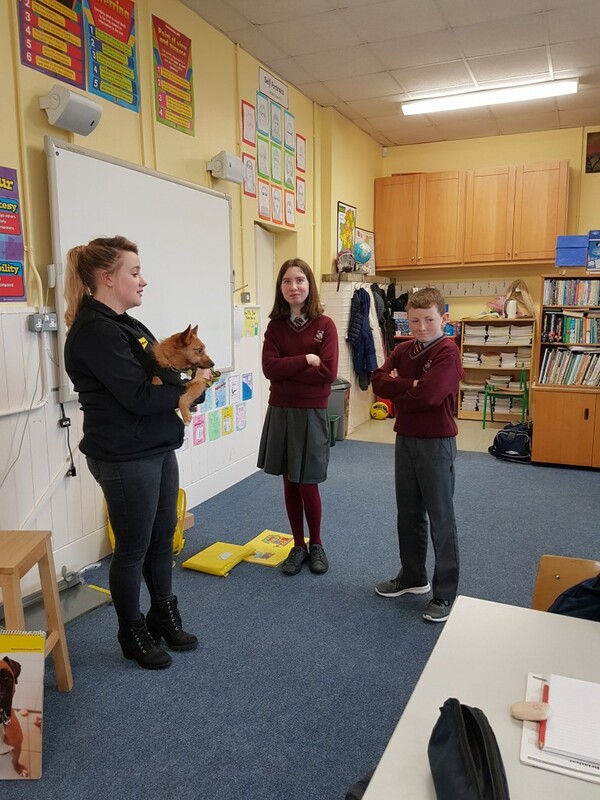 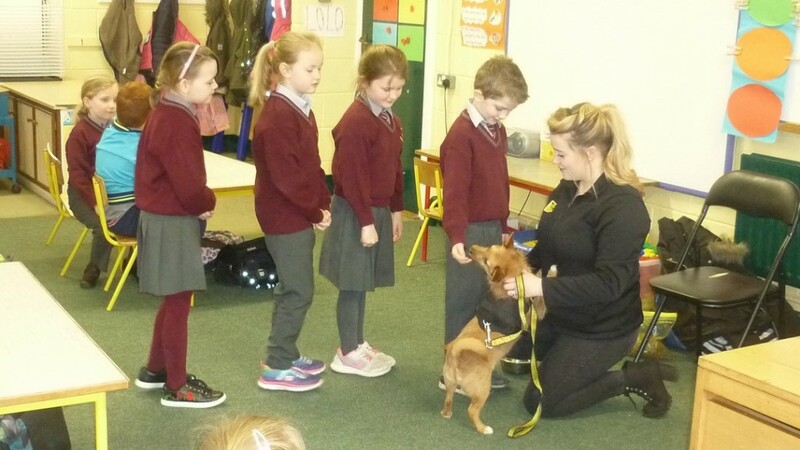 The children learned about the great work of Dogs Trust Ireland, what it takes to care for a dog and how to be safe and responsible around dogs. The pupils really enjoyed the visit. 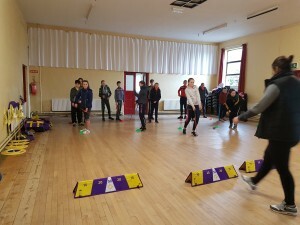 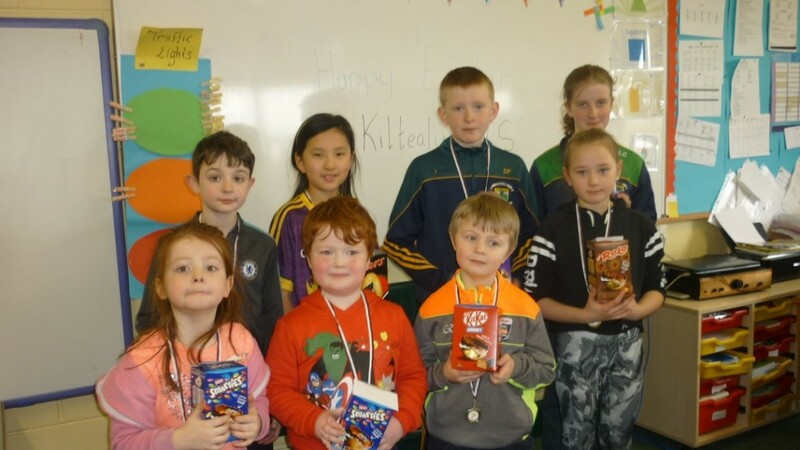 The students enjoyed partaking in the numerous activities during Seachtain na Gaeilge.Congratulations to the students who won prizes for speaking the most Irish in the respective classrooms. 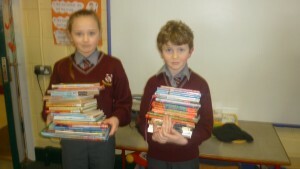 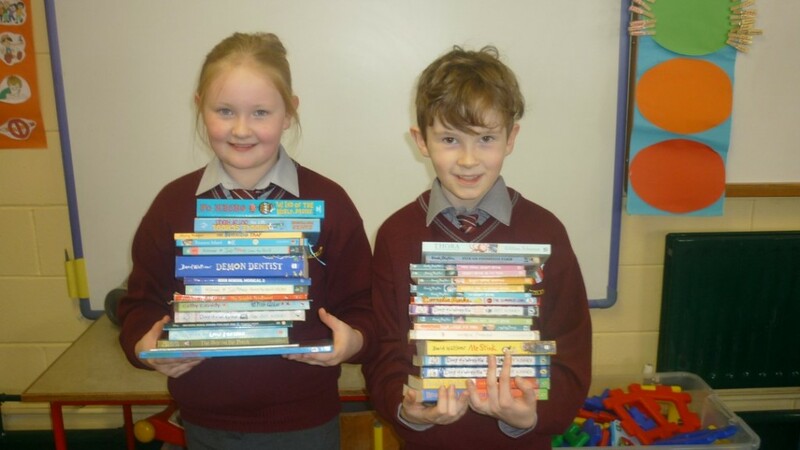 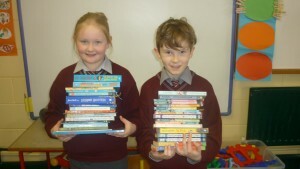 Well done to the Student’s Council,who collected lots of books for our classrooms as part of World Book Day. 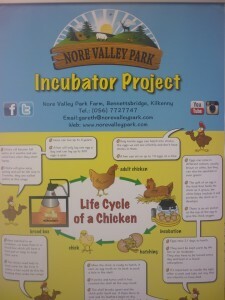 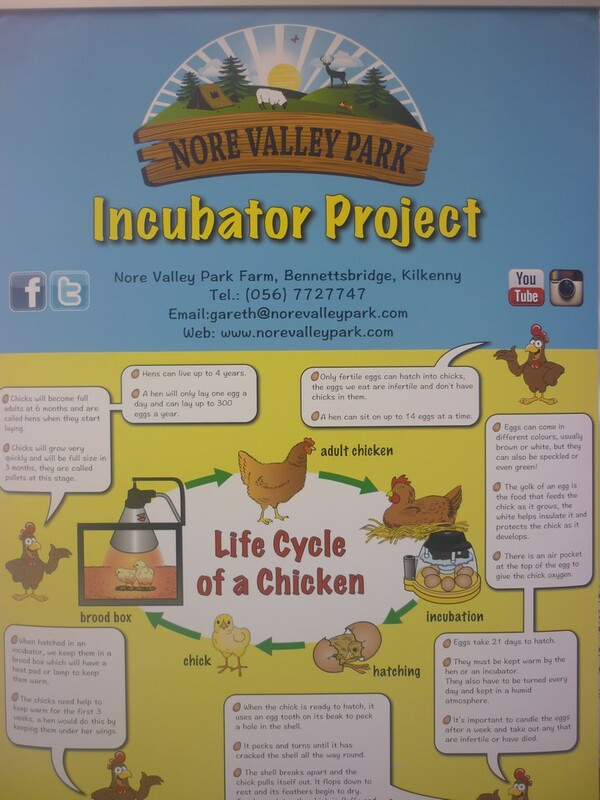 Kiltealy NS partook in the School Incubator Project under the guidance of Nore Valley Park. 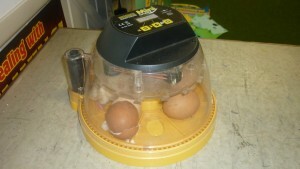 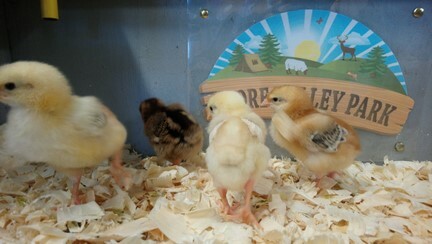 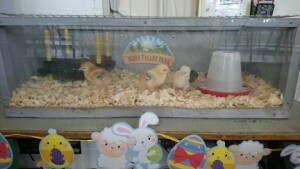 An incubator was delivered to the school with seven eggs. 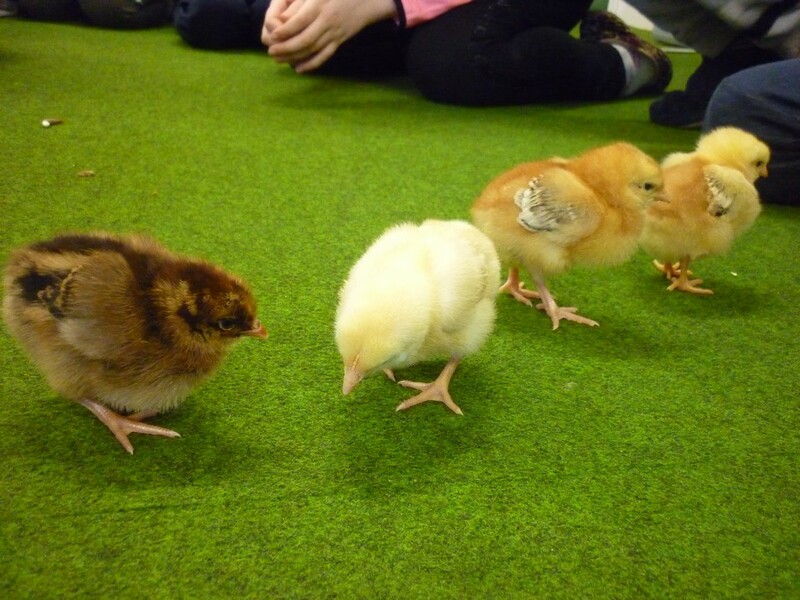 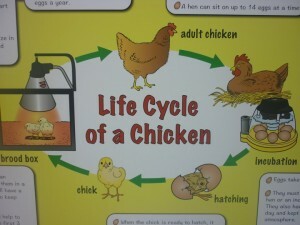 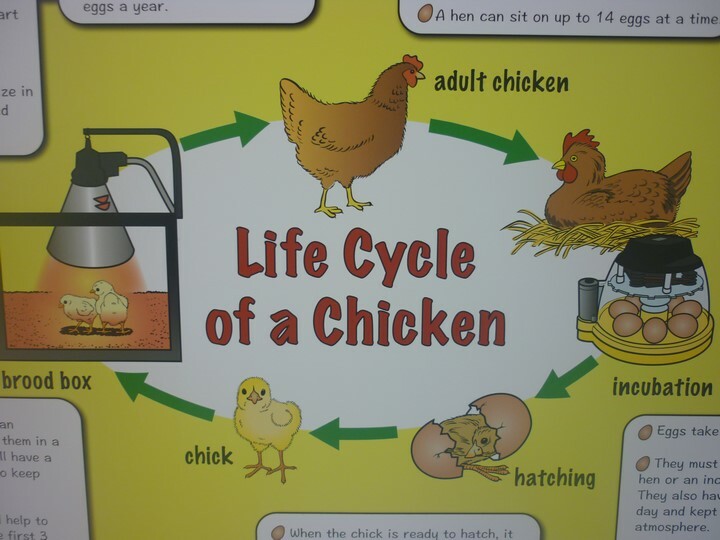 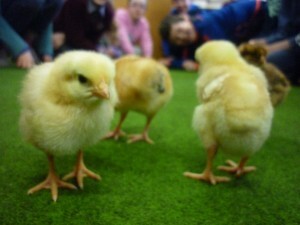 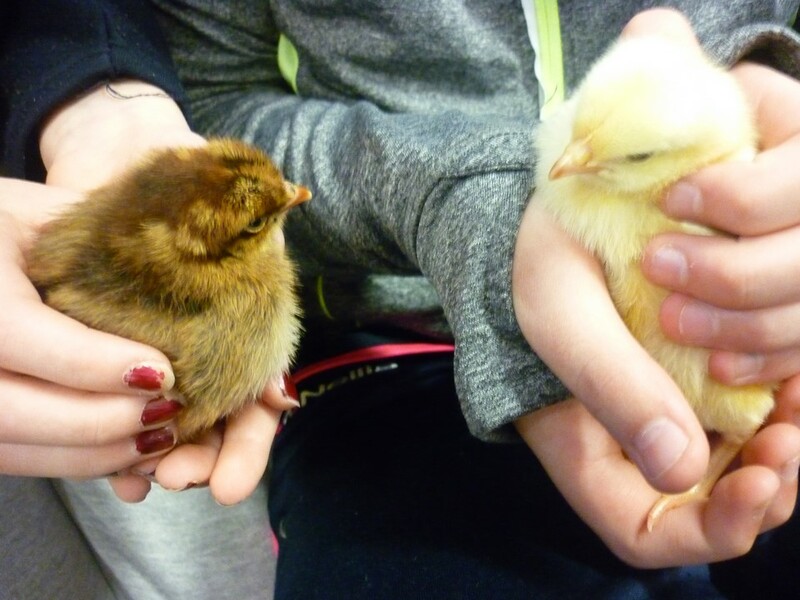 An educational talk was presented to the students about the development and life-cycle of a chick. 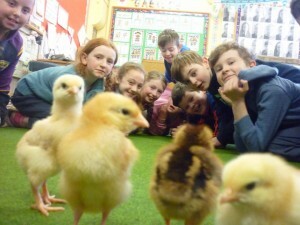 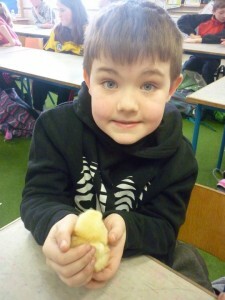 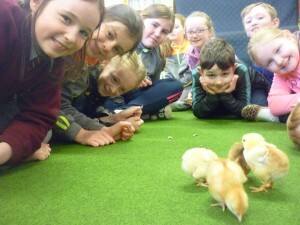 Farmer Brian told the children how to care for the chicks at all stages of their development. The care included; using your quiet voice when around the chicks, not to knock or bang on the incubator and not to scare the chicks. 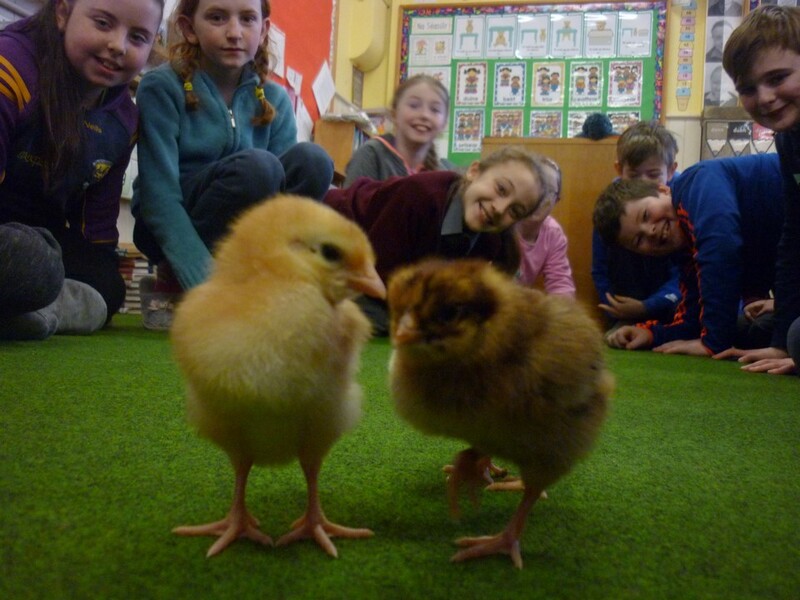 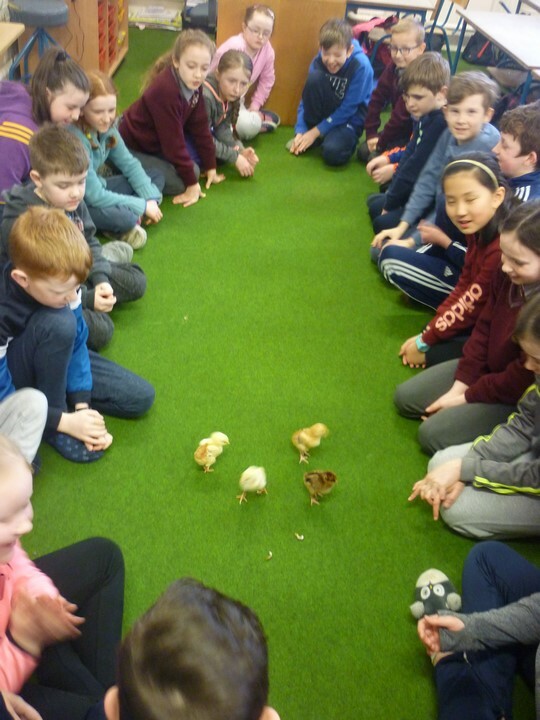 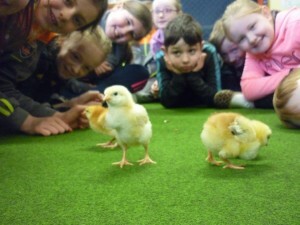 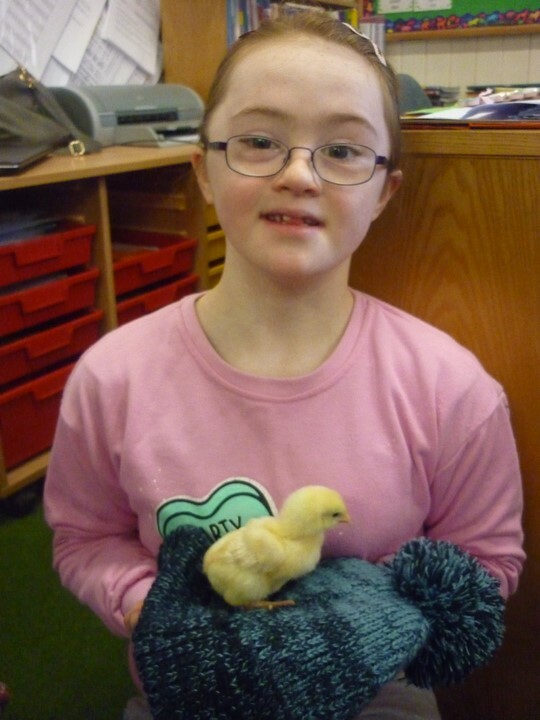 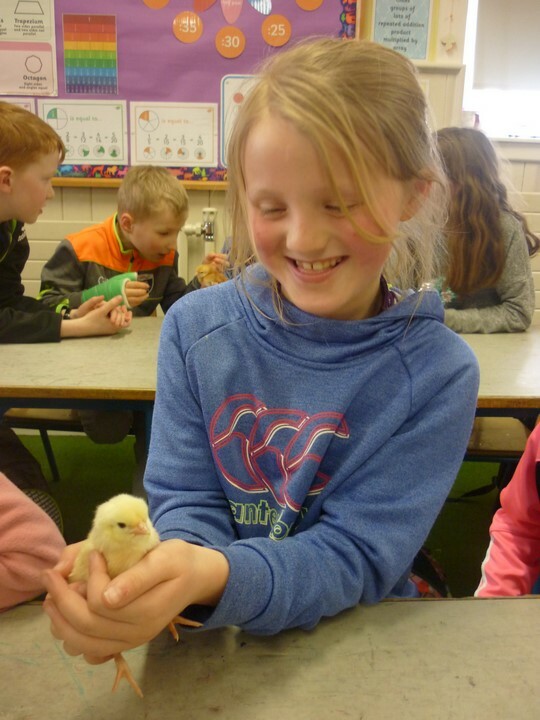 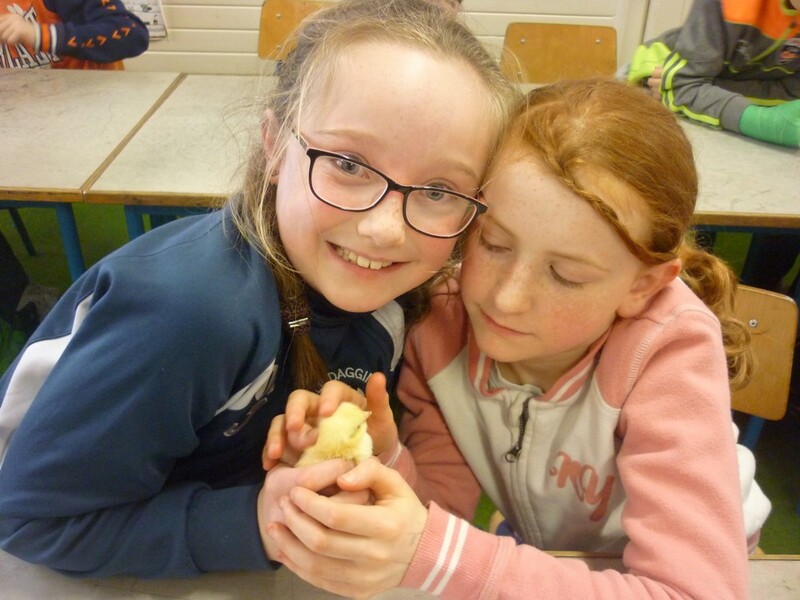 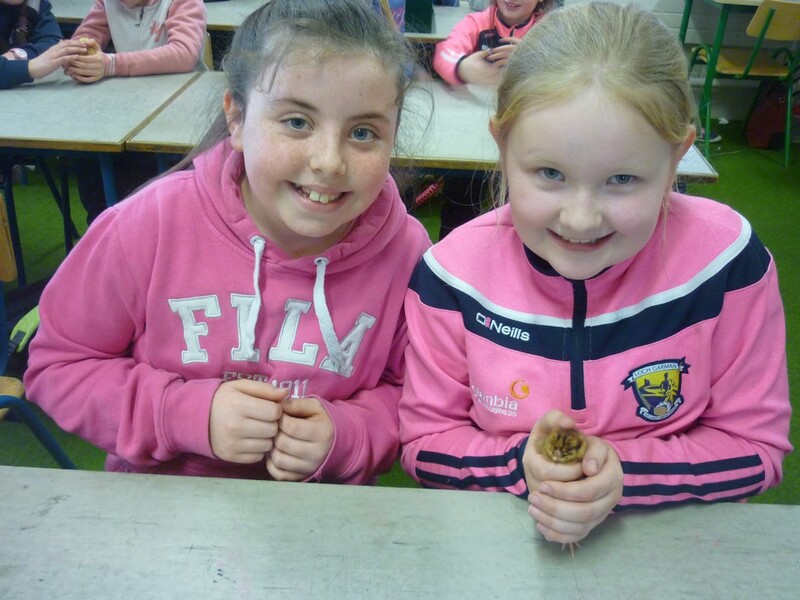 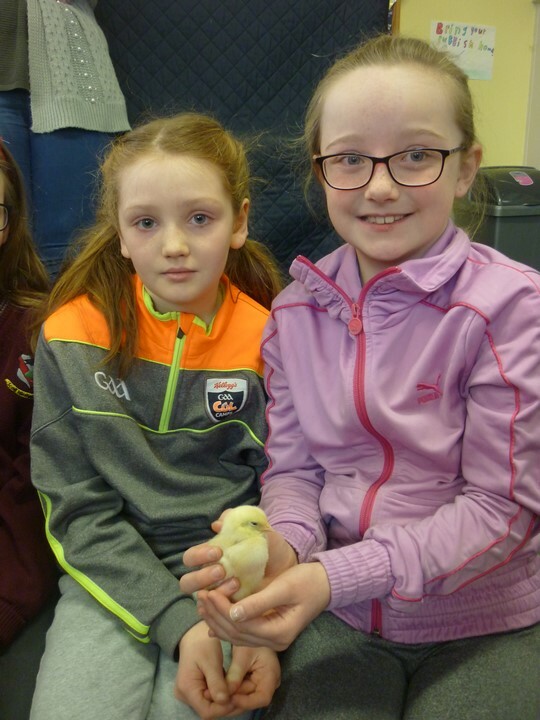 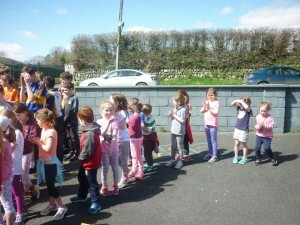 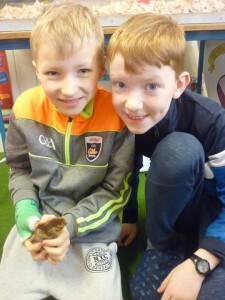 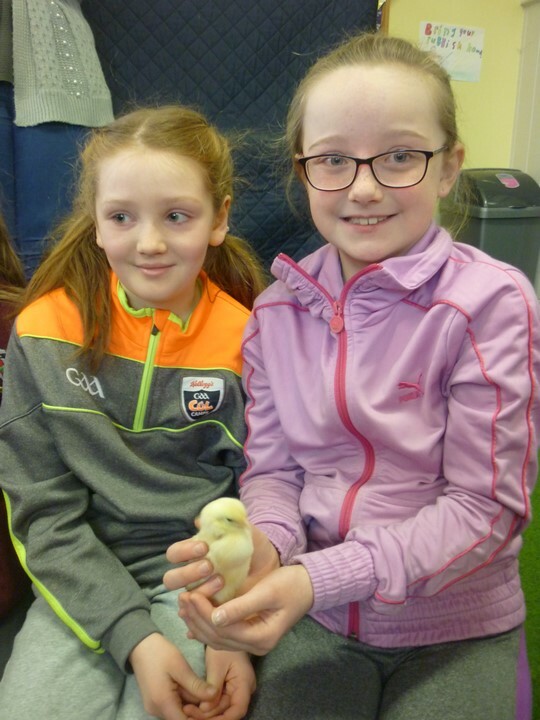 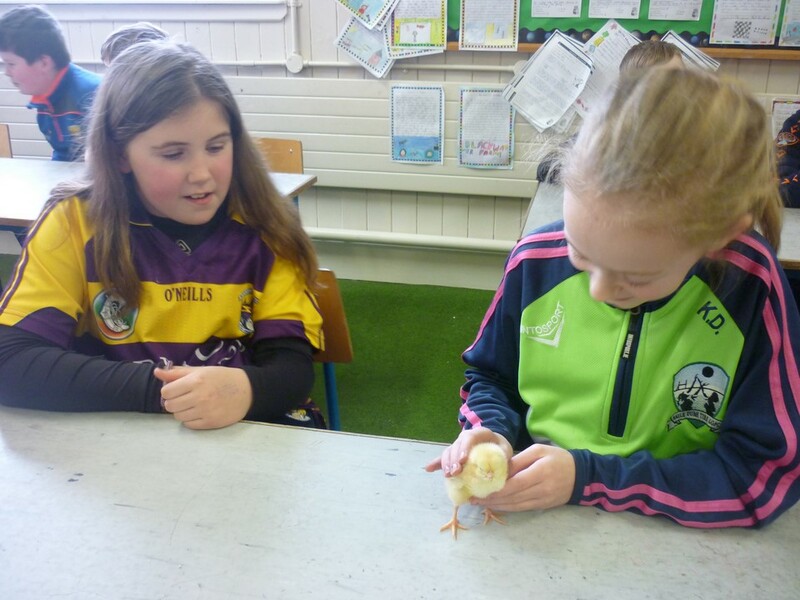 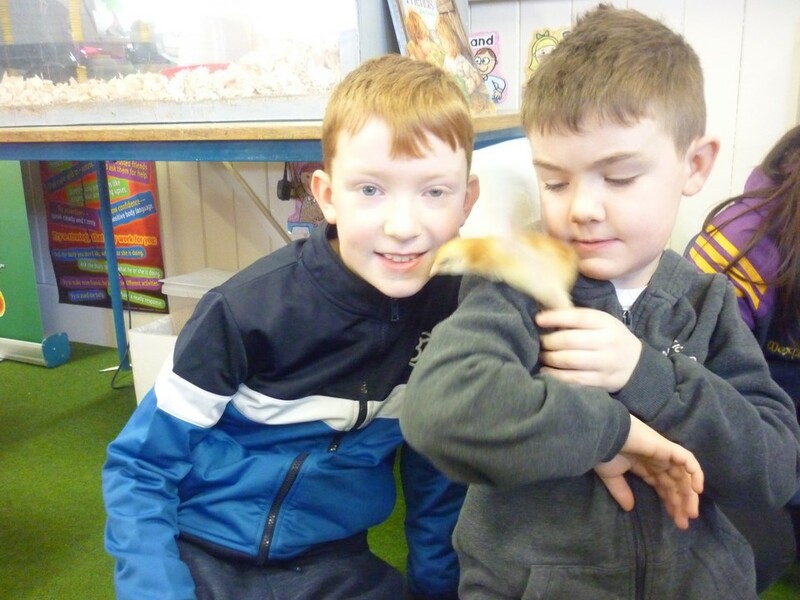 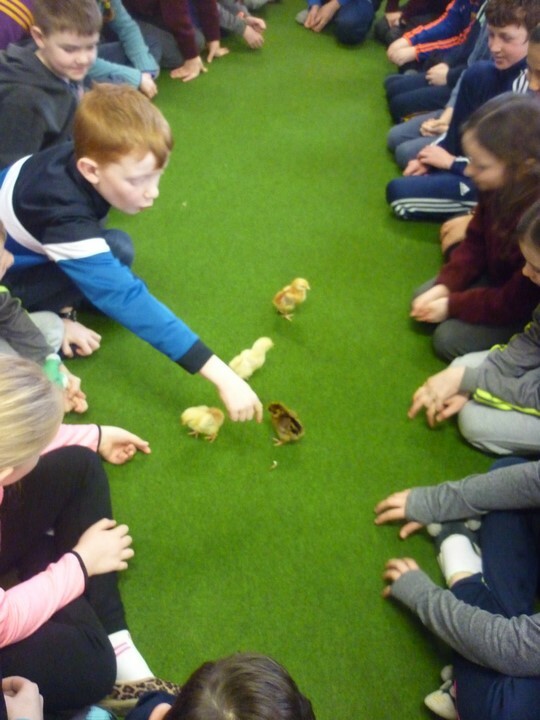 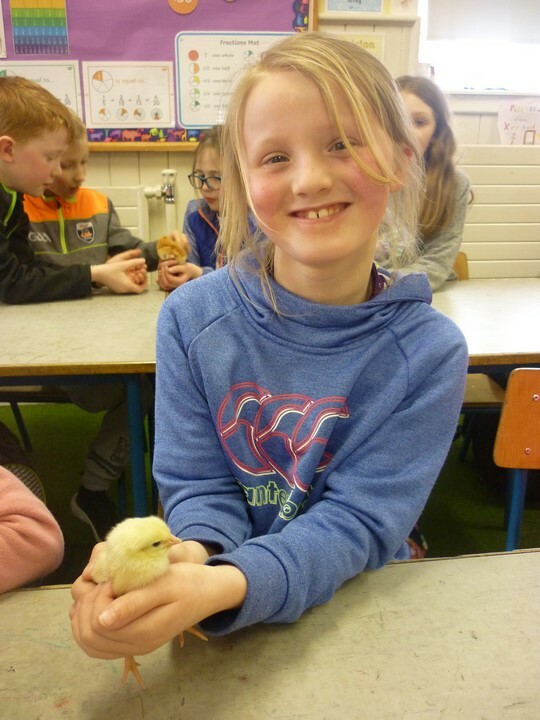 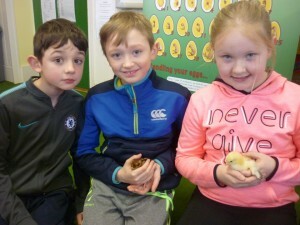 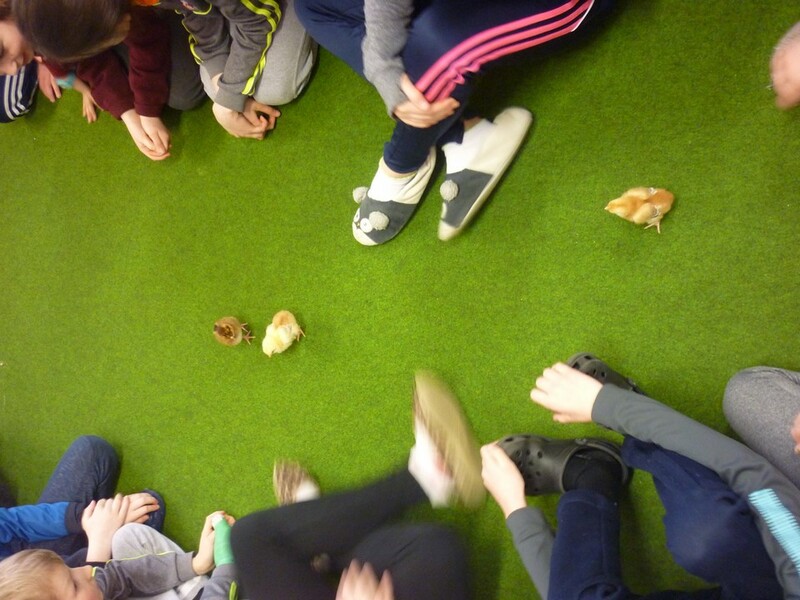 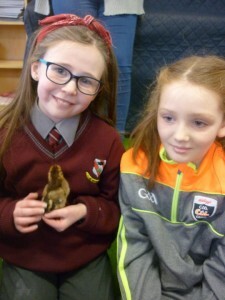 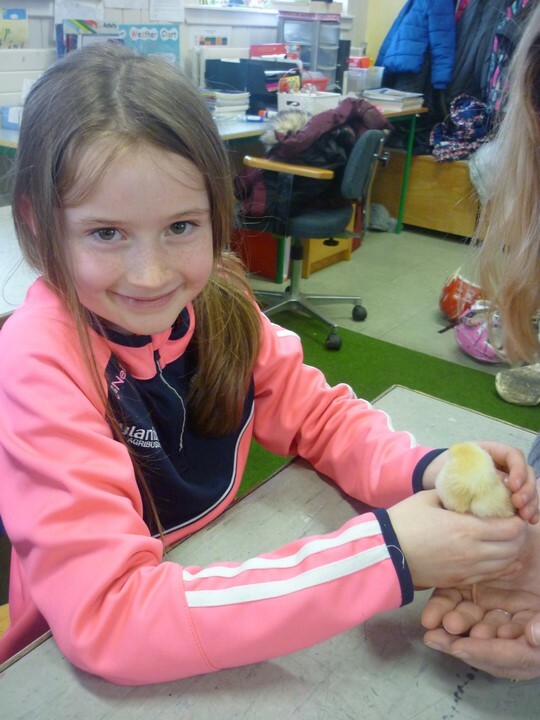 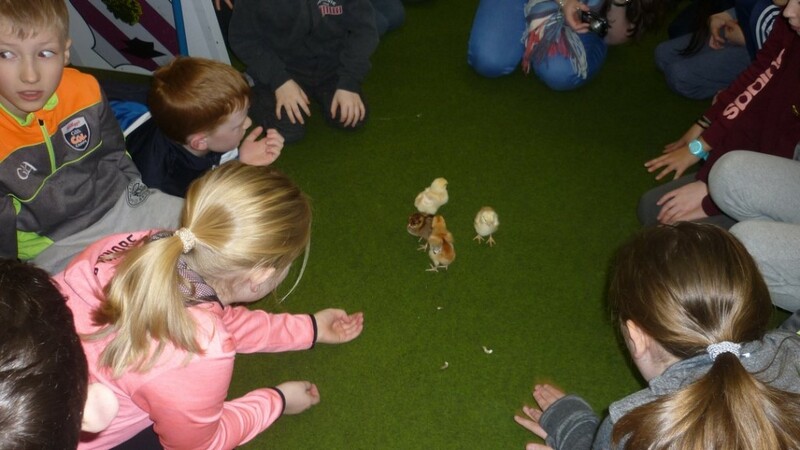 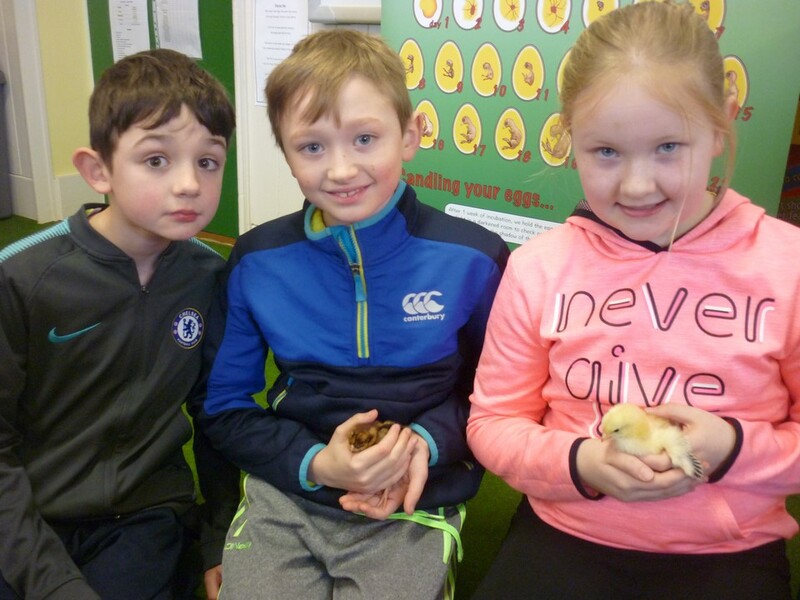 Third & Fourth Class were given special instructions of how to care for the chicks as they would be staying in their classroom for four weeks! We were worried about our eggs during the Beast from the East, but they were visited many times to insure they were warm enough to incubate, thanks to our diligent school staff. After two weeks Farmer Brian came back to visit and check on our eggs. 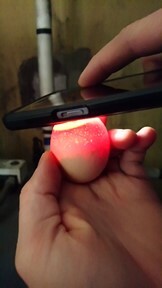 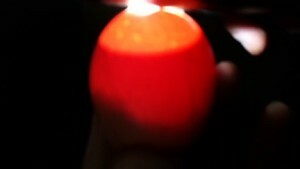 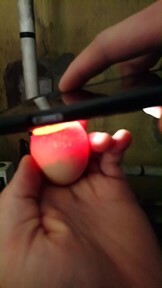 He brought our eggs out into a dark room and held them under a bright light. 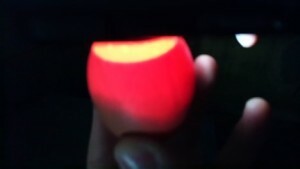 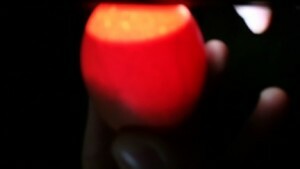 This process is called candling. 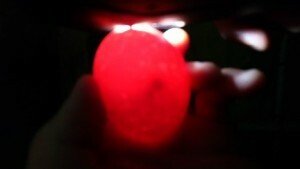 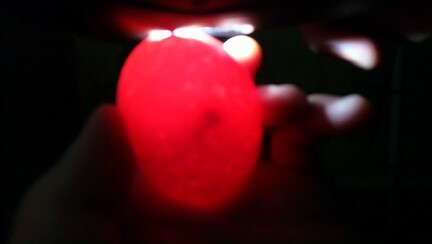 The light shows how the chick is developing. Unfortunately two of the eggs died in the early stages of development. 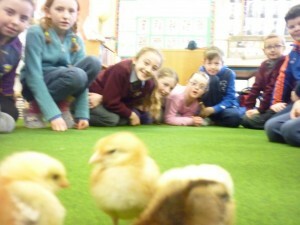 Farmer Brian told the children that this was a normal part of life. Five out of seven chicks were developing normally. 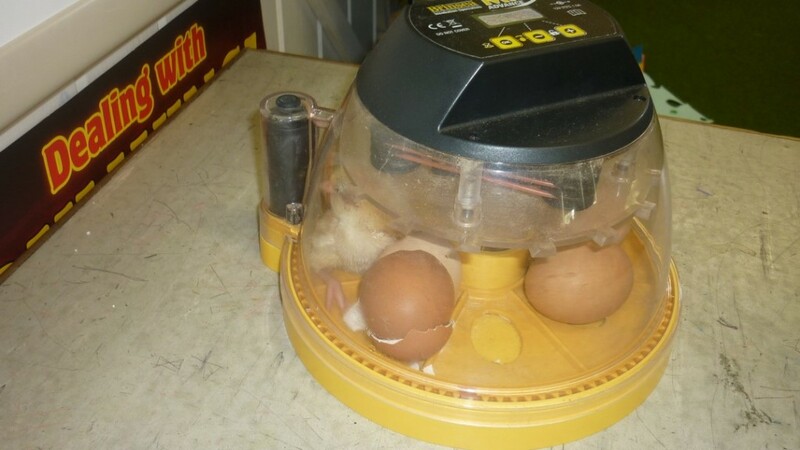 After 21 days the chicks began to hatch. 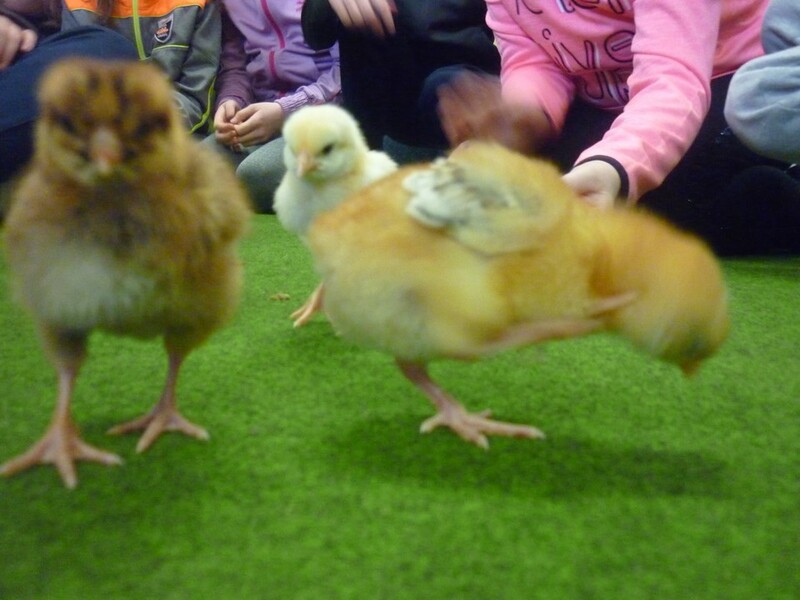 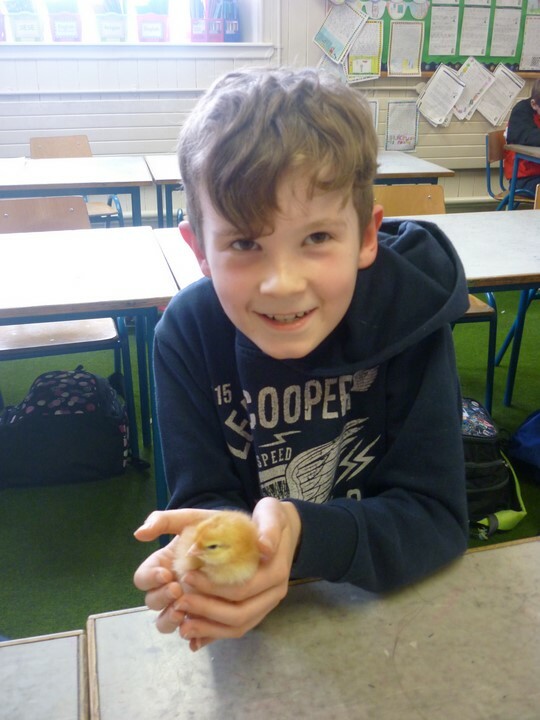 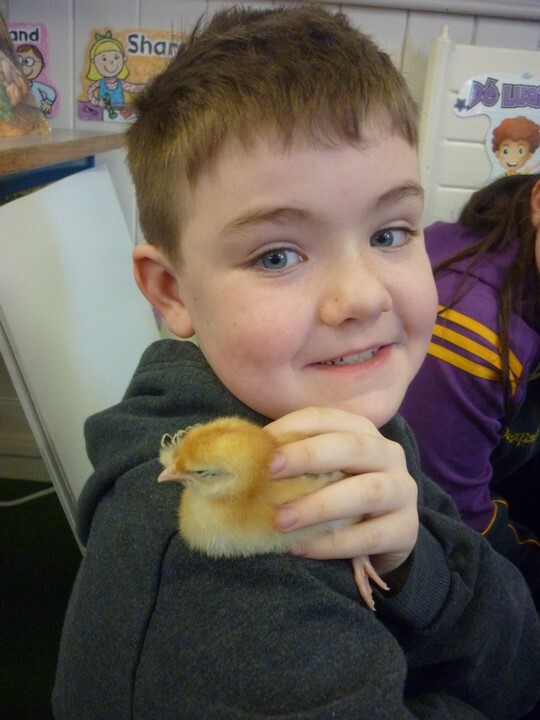 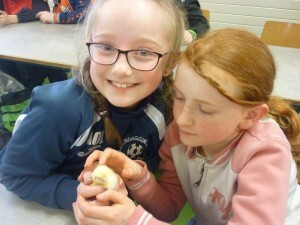 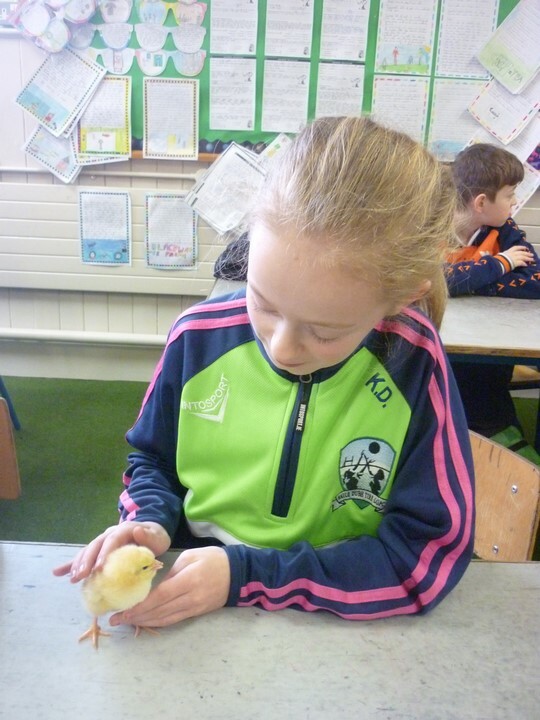 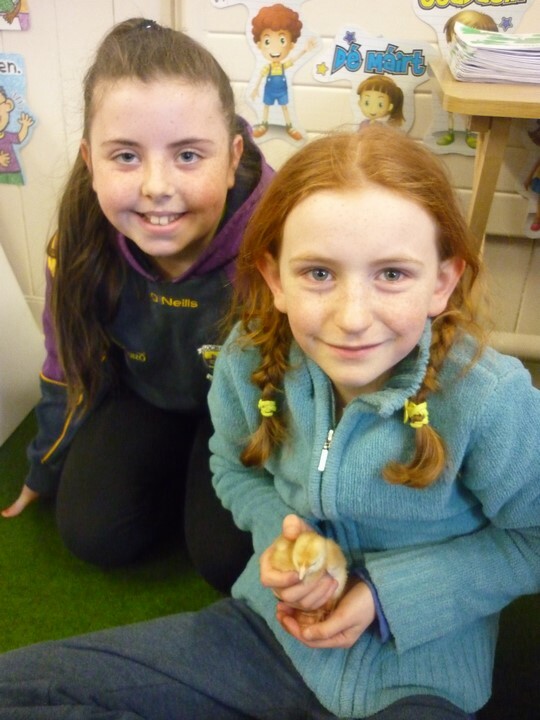 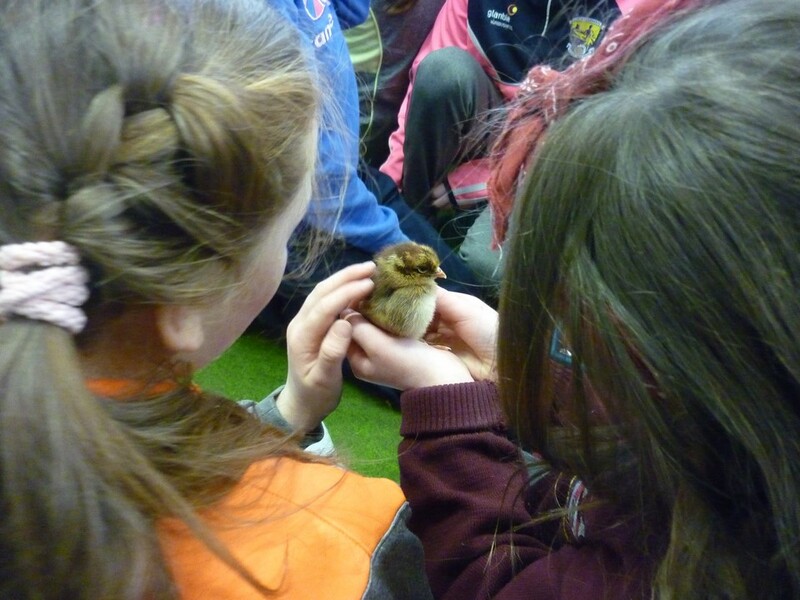 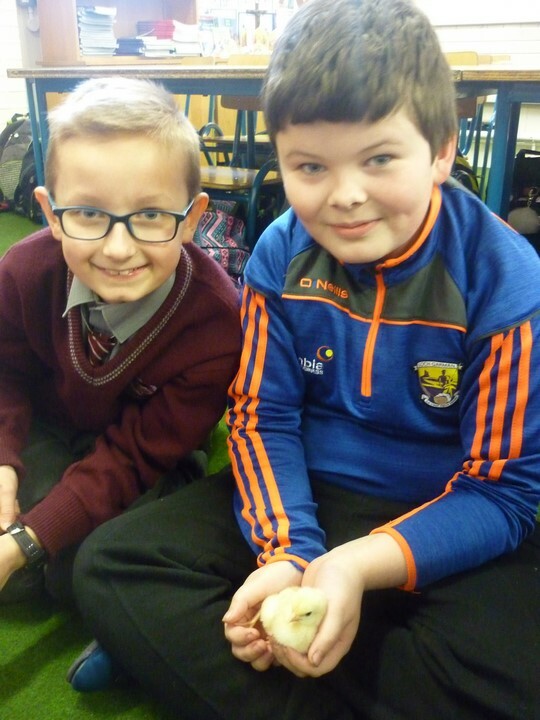 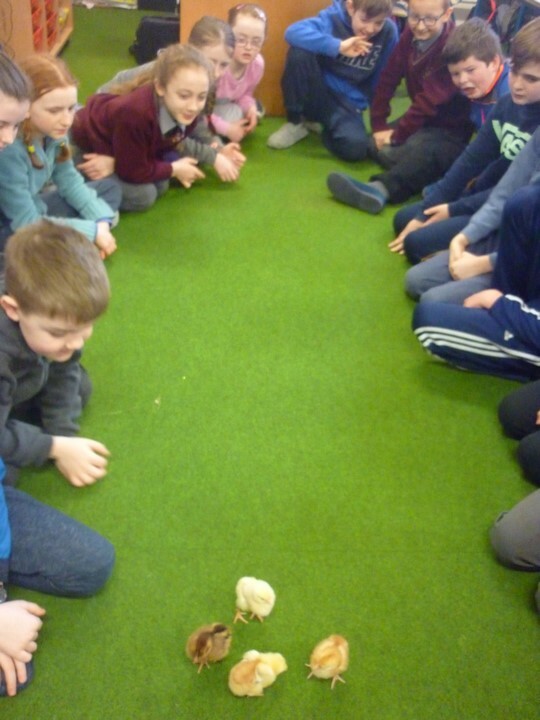 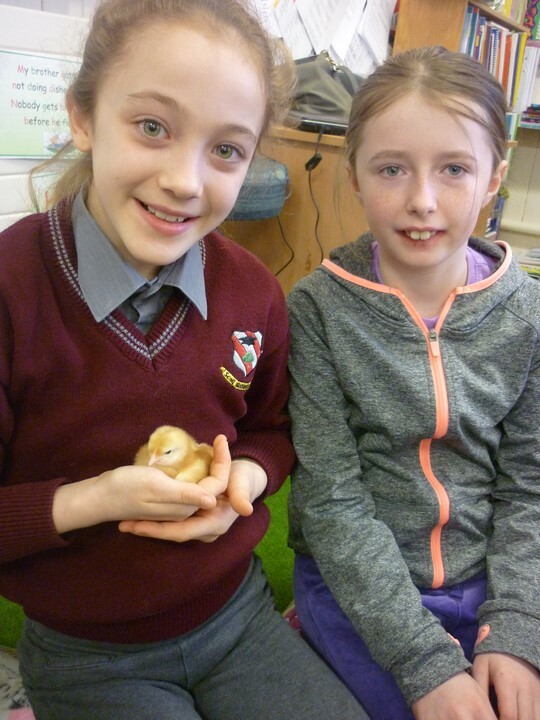 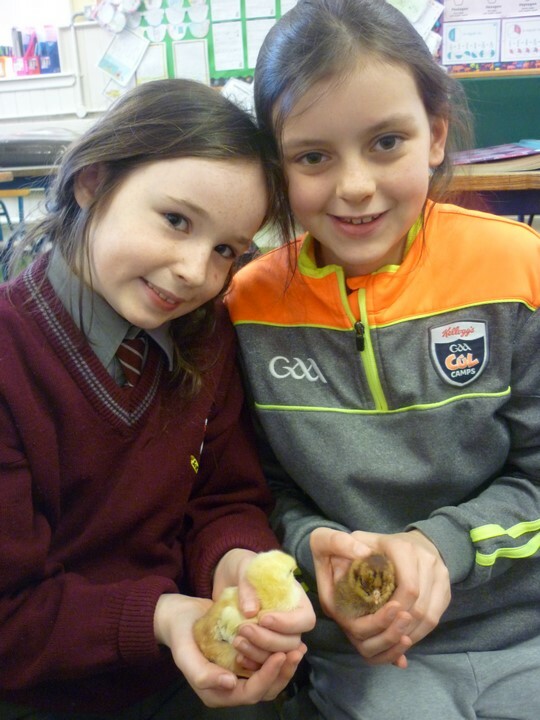 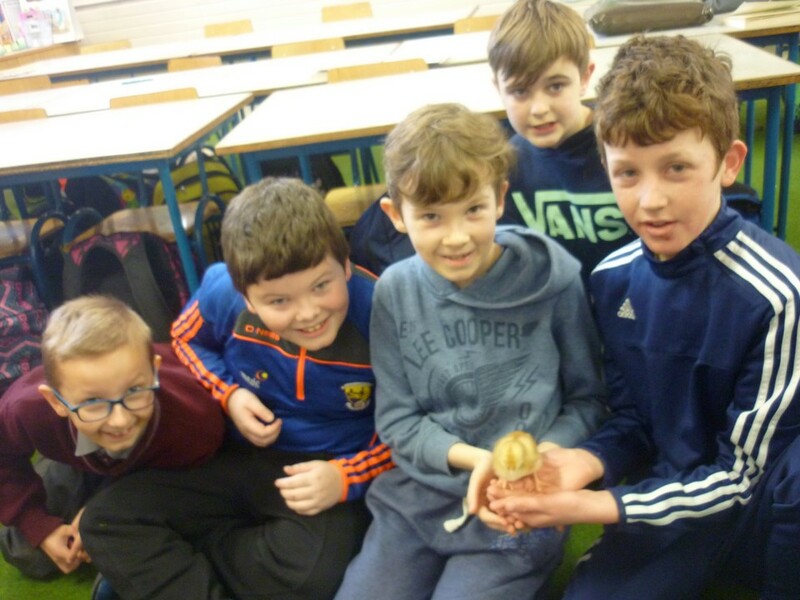 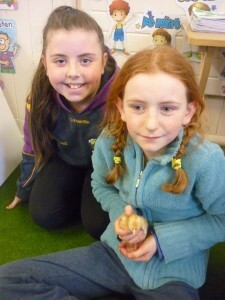 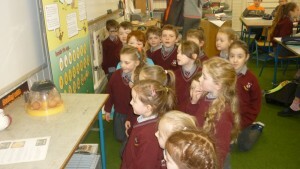 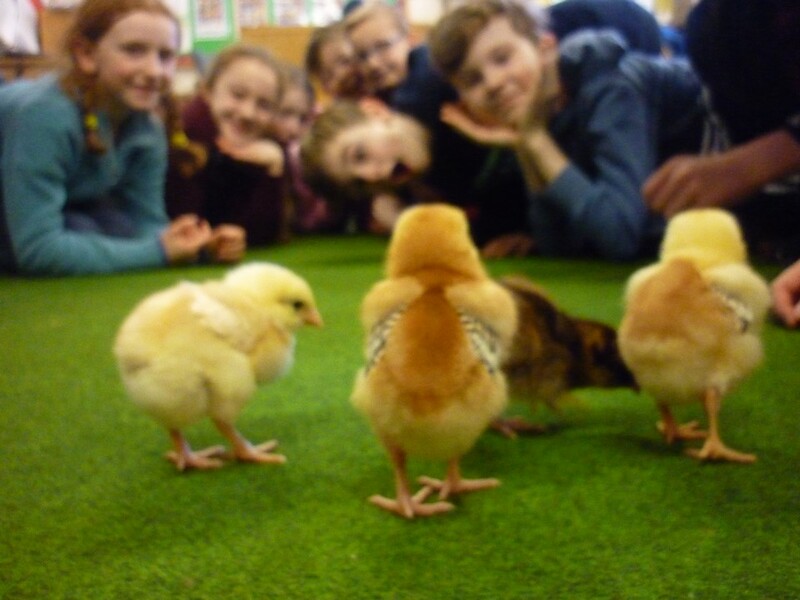 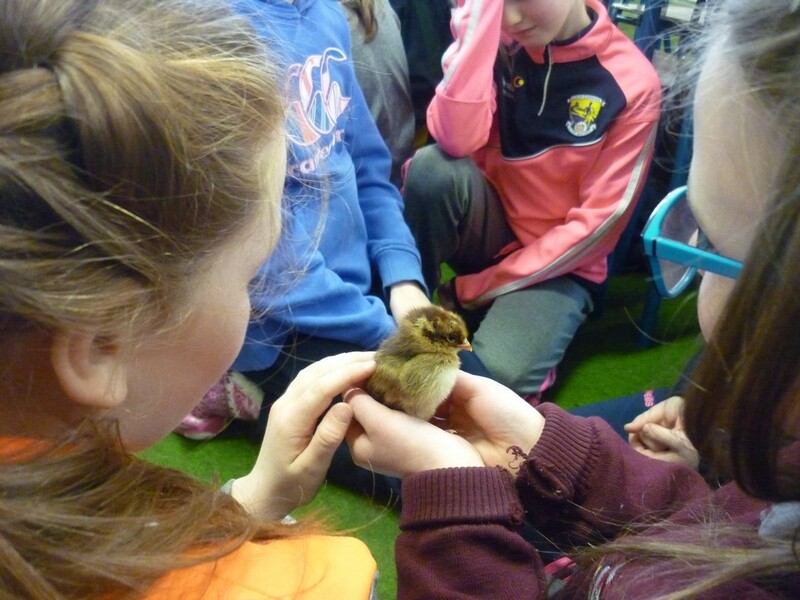 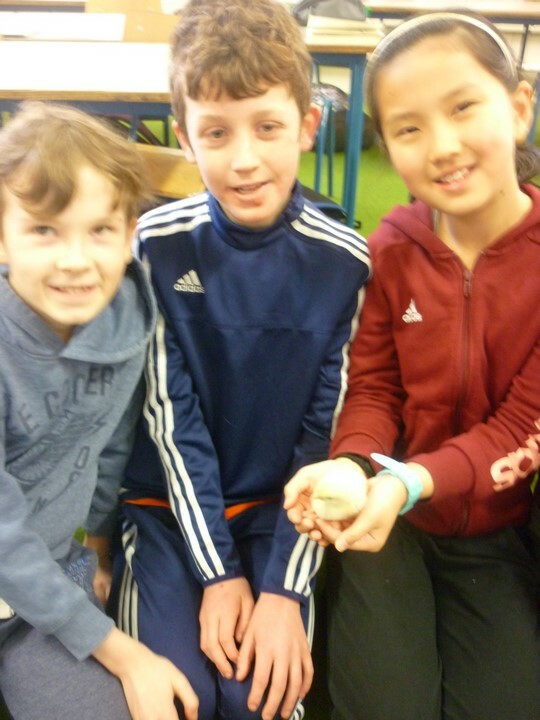 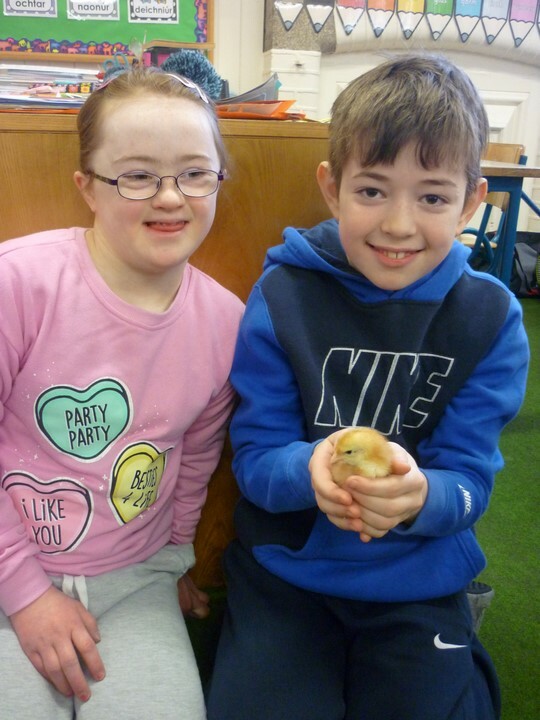 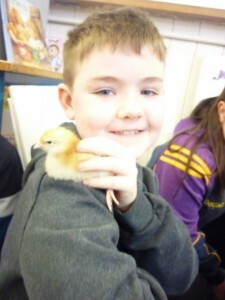 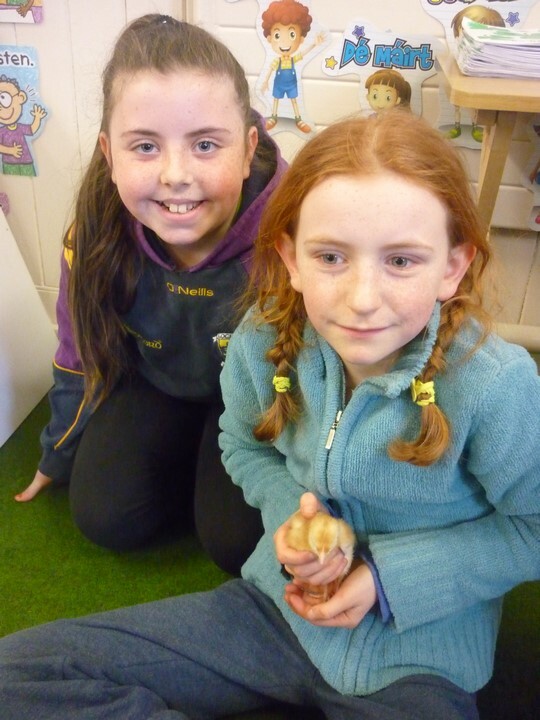 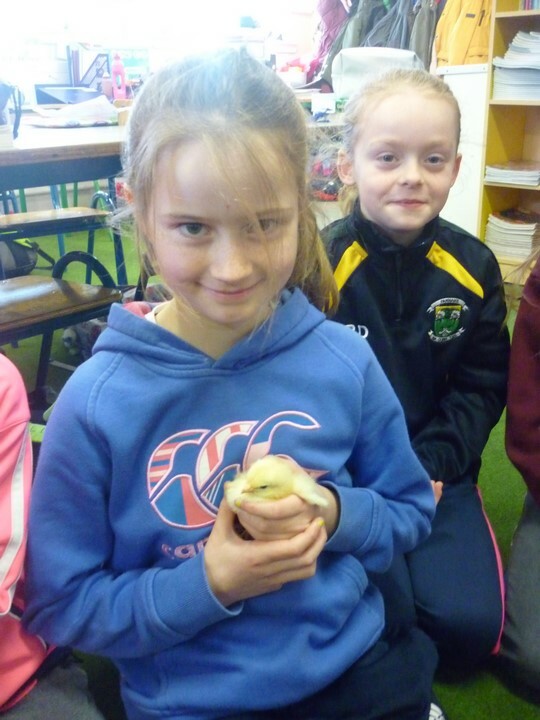 There was much excitement in 3rd and 4th class when 4 out of the 5 remaining chicks hatched. 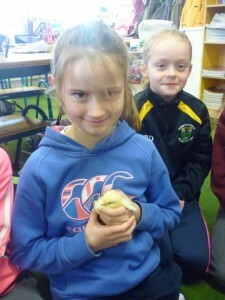 Unfortunately one of the chicks did not hatch. 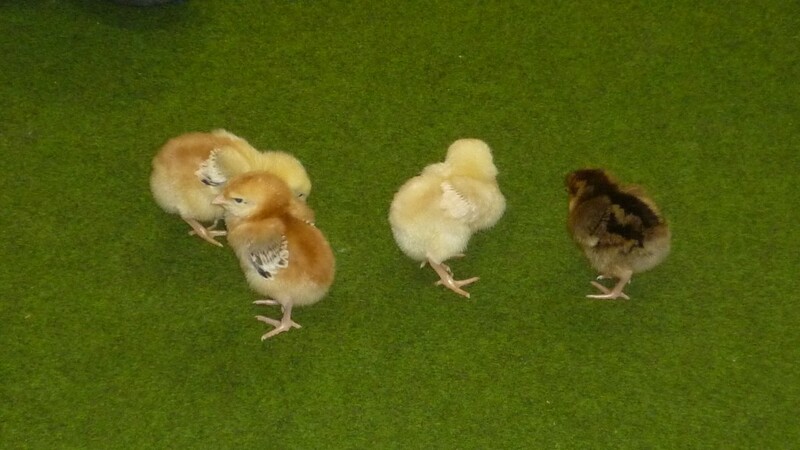 Emma, JJ, Flapjack and LeeChick). 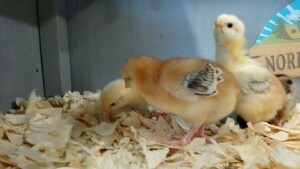 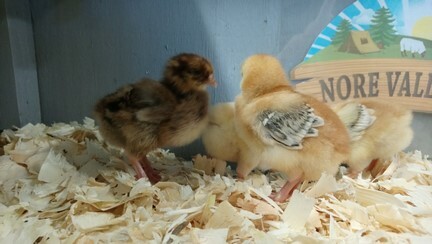 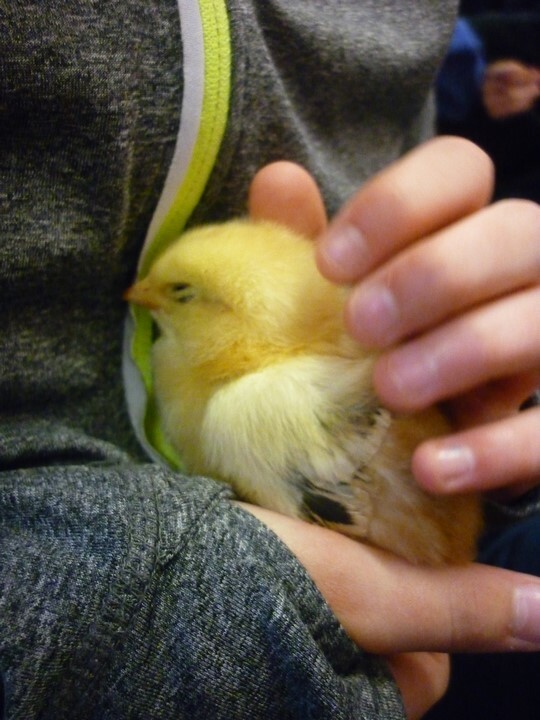 Once the chick hatched we left it in the incubator for a few hours to rest and dry out. 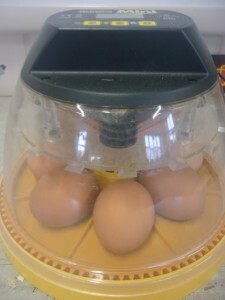 After this time, when it was strong enough it was placed into the brood box which had a heat pad in it to keep it warm. After a few days we fed the chicks and gave them water. 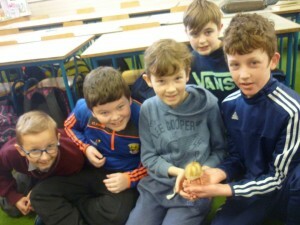 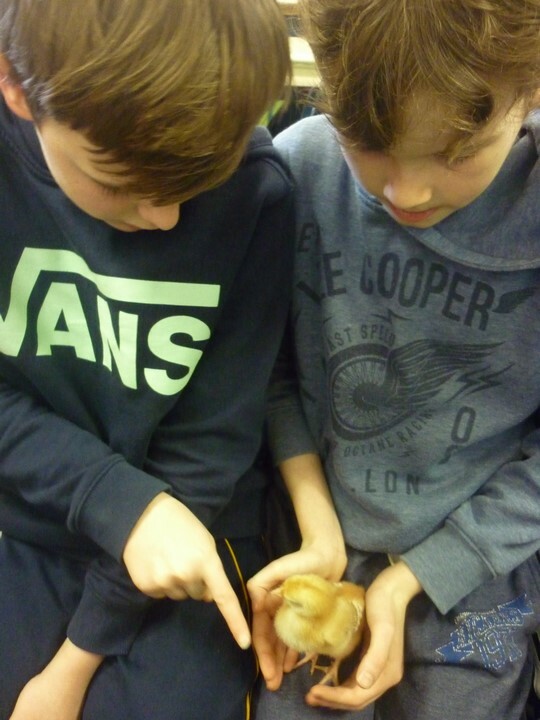 All of the classrooms got involved and visited the newly born chicks. They were so adorable that the children decided to name them all. 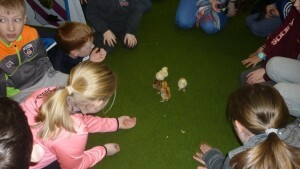 This project generated much excitement and opportunities for learning in our school. 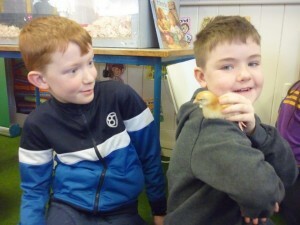 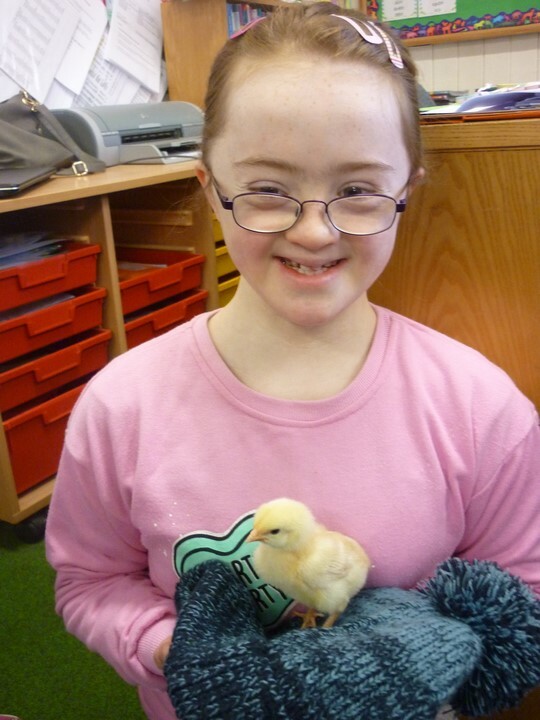 Many people from the local community even called in to meet our chicks also.